We had several days of ferocious stormy weather last week with gale force winds and torrential rain keeping us confined to barracks and giving the garden a bit of a bashing in the process. 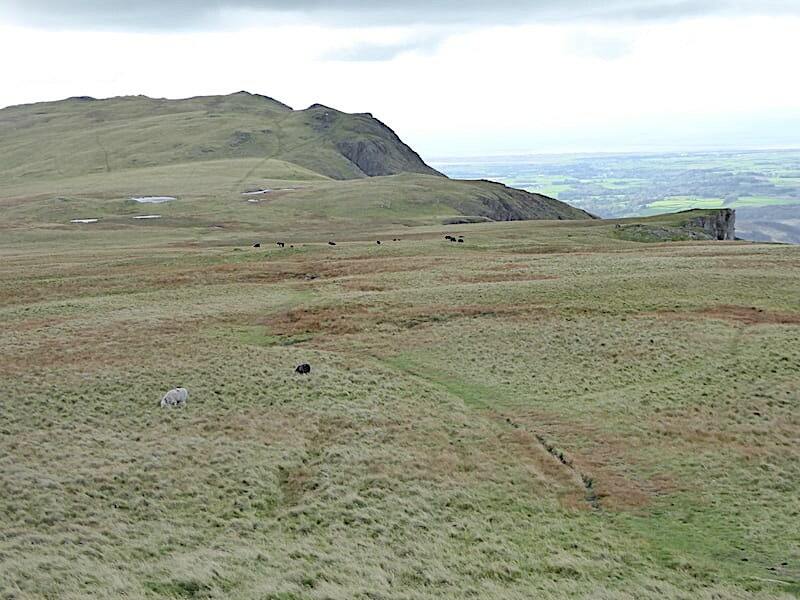 No other damage than that though so, having put the garden back together again, we thought we’d carry on with our ‘we haven’t been there for ages’ list and haul ourselves up Whin Rigg and over to Illgill Head. The forecast wasn’t great but was promising enough and about as reasonable as could be expected now that we are into autumn. Our packs have had the usual change of season makeover, warm weather stuff came out, since its unlikely that we’ll be needing sun cream and sweat mopping towels for the next few months, and cold weather stuff went back in, gloves, hats, extra layers and so on, although we did draw the line at including the microspikes since just about the only thing the forecast didn’t mention was snow and/or ice. All the other possibilities it mentioned, plus one it didn’t, we got a taste of somewhere along our route. 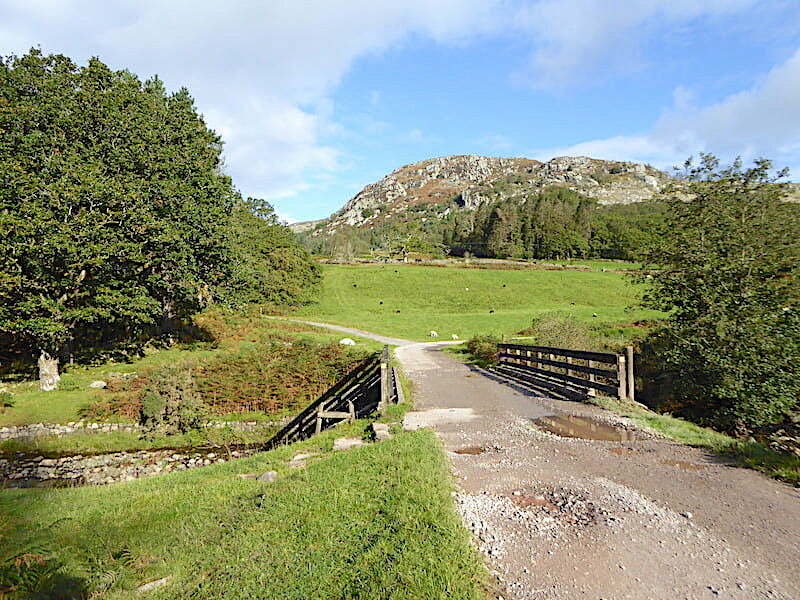 We started out at the empty parking area in Miterdale on a lovely sunny morning, got ourselves sorted out and then set off across the bridge following the forest track curving over towards the trees on the left. Despite the sunny morning there is still a nip in the air so our jackets remain on for the time being. A forest track behind me now has a ‘CCTV in operation’ sign attached to the gatepost, something which wasn’t there the last time we visited. That was ten years ago though so its not so surprising that even secluded Miterdale should have caught up with modern technology. The craggy outcrop directly ahead is Great Bank. The view from the bridge as the River Mite burbles its way down to Ravenglass and the sea. The forest track leads gently up hill where we leave it at this point to follow the stony track through the forest. 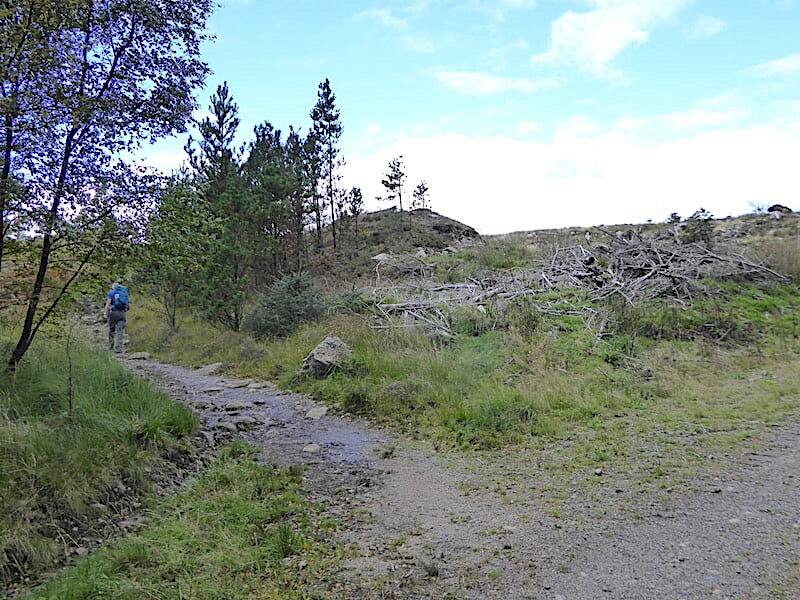 We passed several Forestry Commission notices along the way concerning the closure of a bridleway somewhere in the area, from July to January, where work is to take place to clear and extract windblown trees. After last week’s storms there’ll be a whole lot more to clear than was initially planned, judging by what we noticed as we walked along. 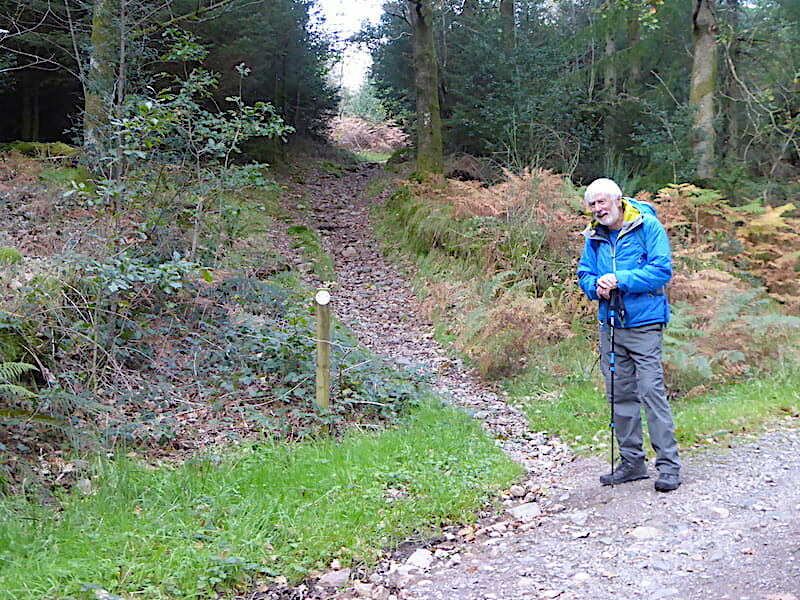 The stony path leads us up to a second forest track crossing, all signposted so there’s no need for any dithering about which way to go …..
….. and similarly at the third forest track crossing where J stands and views Great Bank. 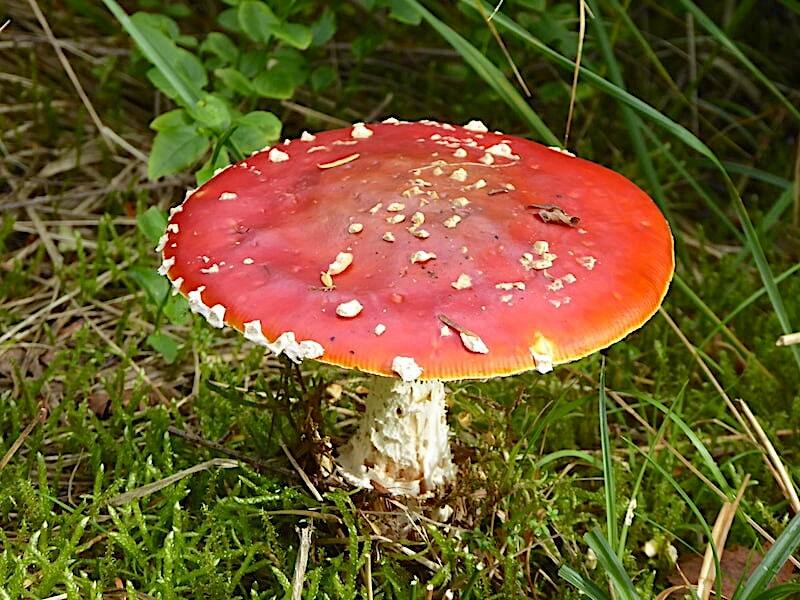 Fly Agaric fungus growing alongside the path as we continue to climb through the forest. At the top of this section of path was a handy memorial bench where we stopped to remove the outer layers of jackets and jumpers. 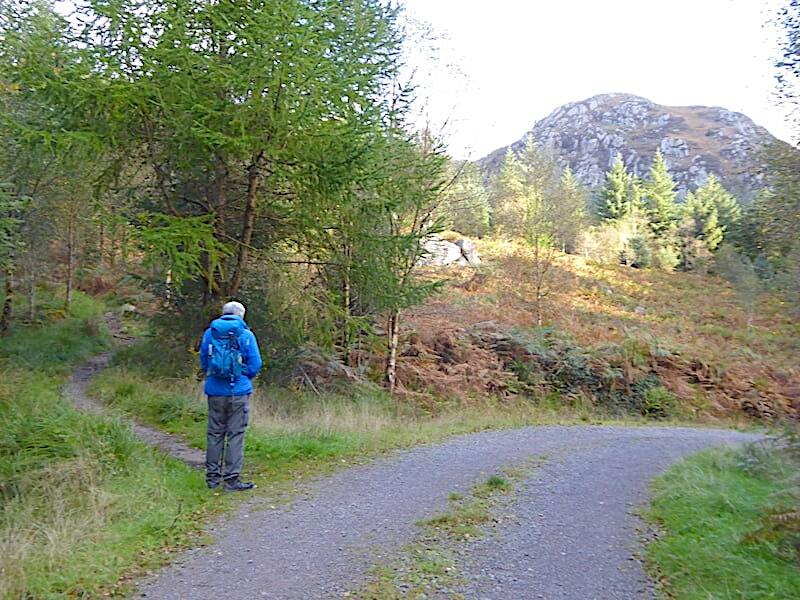 We were sheltered from the nippy wind in the forest and the steady climb warmed us up very nicely. A clearing provided enough light for a quick shot while J is about to disappear into the forest gloom once more. 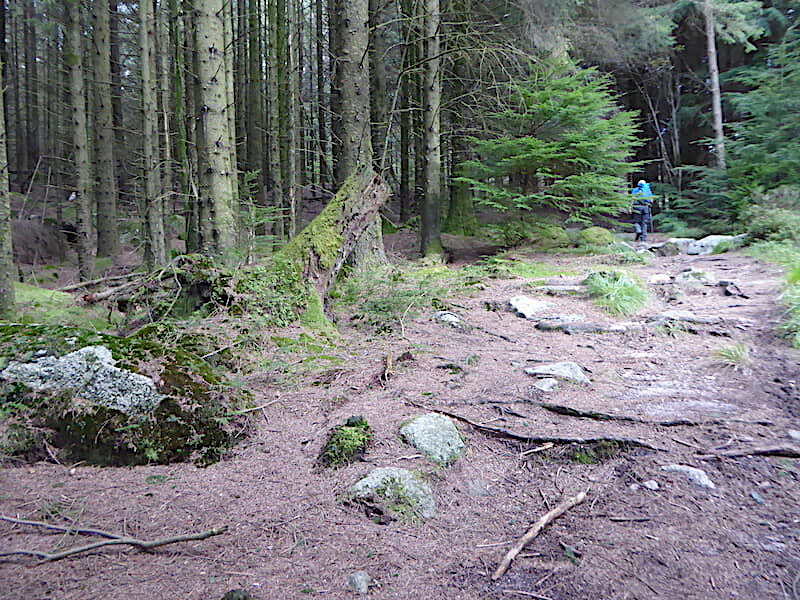 The route climbs steadily but its never excessively steep and the years of fallen pine needles have provided a lovely soft path to walk over, a very welcome contrast to the rough stony ones we’ve walked so far. 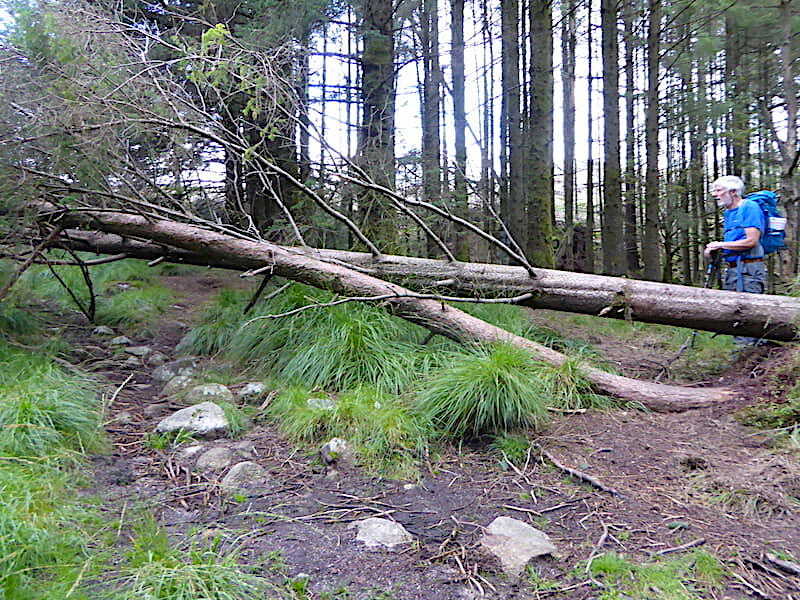 Storm damage blocking the path. Our limbo dancing skills are not what they were so it was either a crawl on hands and knees or a careful clamber over the spiky remains of the side branches, we opted for the latter. No “ouch” was uttered by either party. 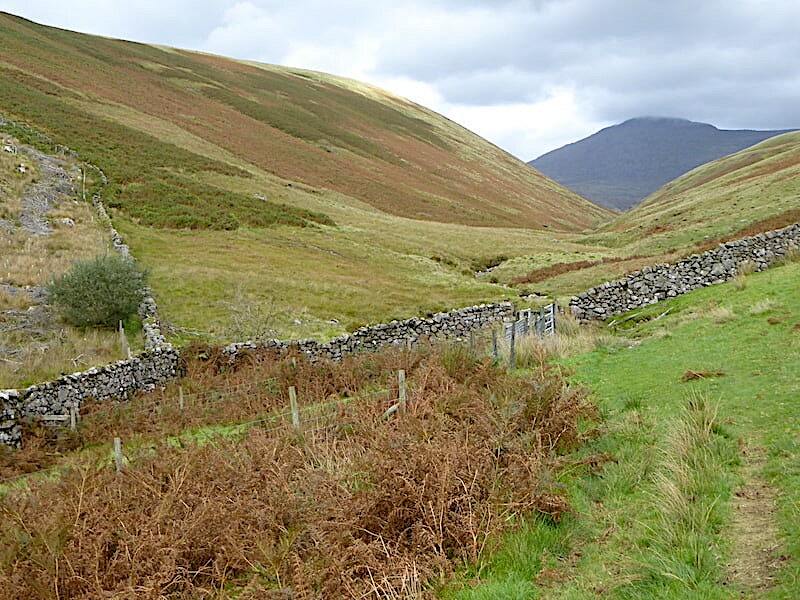 We emerge from the forest and follow the bridleway up to the wall across Irton Fell. 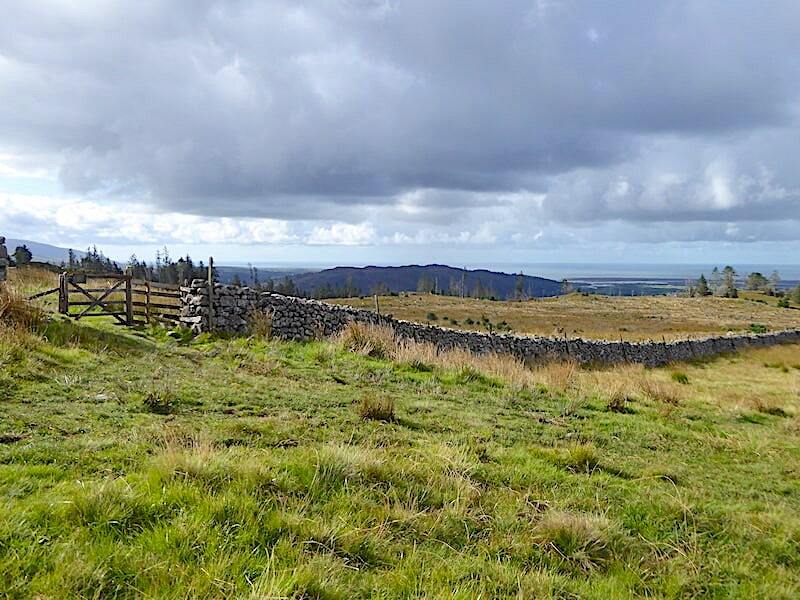 The bridleway used to pass through densely planted forest but this area was cleared about six or seven years ago with the aim of removing the harsh tree lined boundary between the forest and the ridge to improve the views and benefit wildlife. 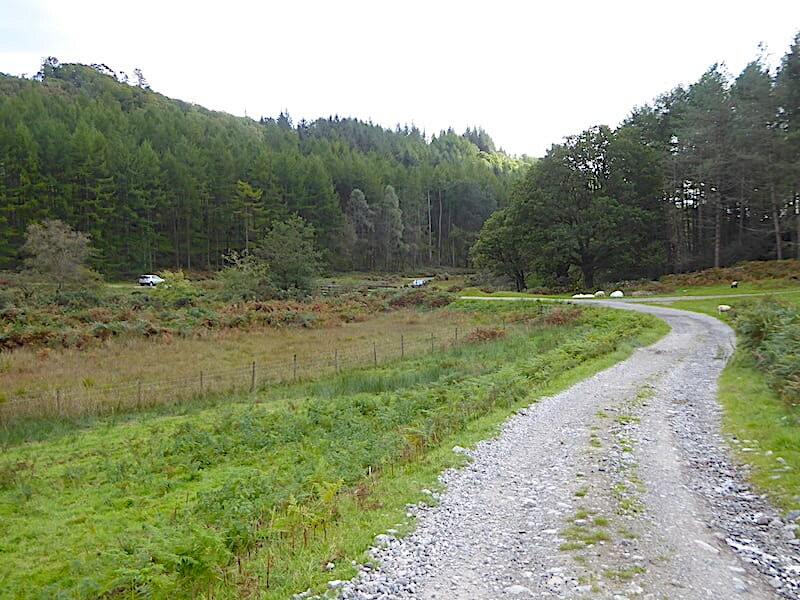 Partial planting of some native broadleaf trees was also planned although all we couldn’t see any evidence of them. It still looks very desolate, punctured as it is with bleached tree stumps and strewn with discarded brash, even after a few years worth of regeneration. 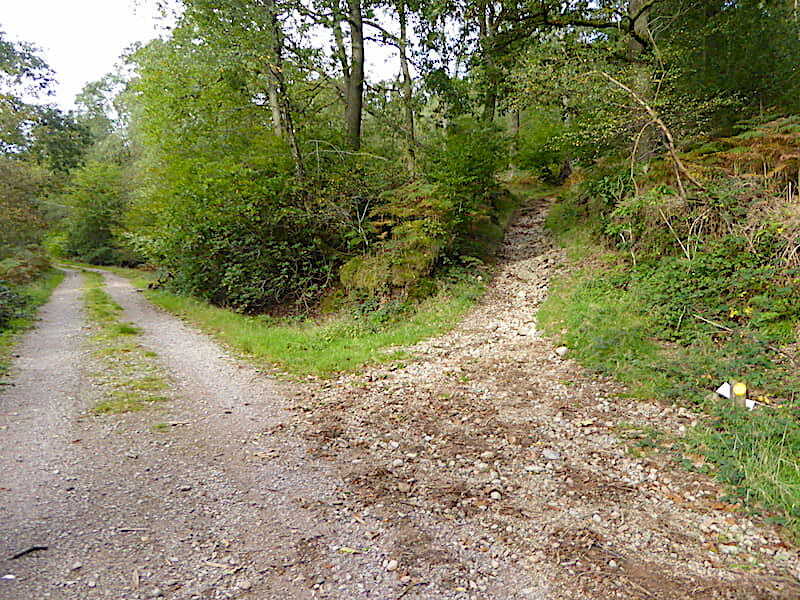 It looks as though some attempt has been made to counteract the bogginess as we take to the path alongside the wall up Irton Fell but it was still a squelchy trek despite the addition of the stones. Walking along the grass was no better either. The shot is looking back towards the coastal plain and the sea with the tree covered Irton Pike, on the extreme left. Alongside the wall a young pine has managed to establish itself, and Laurel and Hardy singing ‘On the trail of the lonesome pine’ somehow lodged itself in my brain. Odd isn’t it, how something you see just starts something going in your head without any conscious thought process. Another escapee from the razed pine forest on the slopes of Irton Fell. 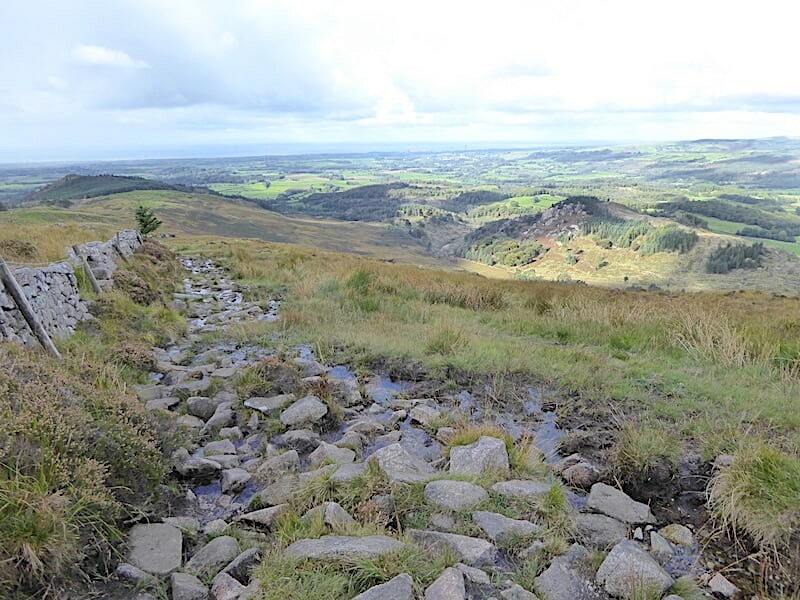 Above it, on the slopes of Whin Rigg, a splash of sunlight dispels the general gloom for a short while. Back at the gate we’d stopped and put our jumpers back on again, the protection of the forest had gone and the cold north westerly was raising goosebumps on bare arms. 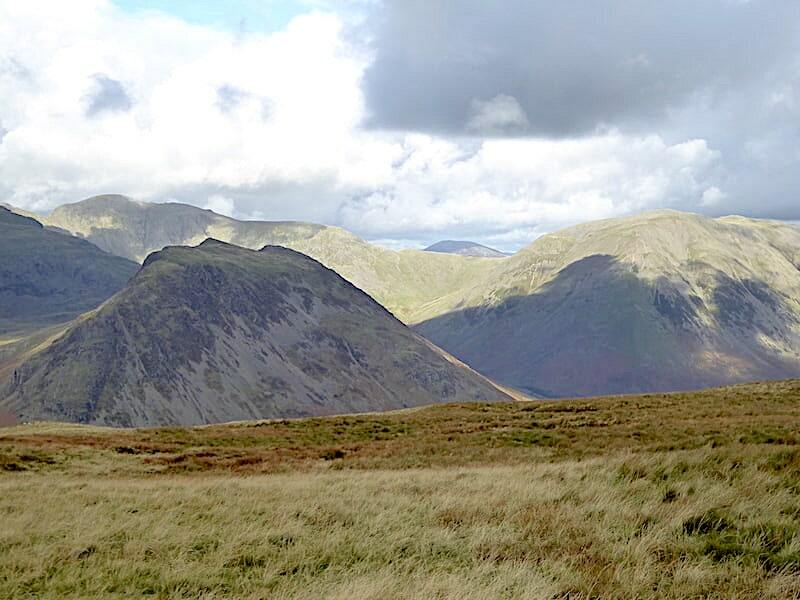 Across the Wasdale valley though things were decidedly subdued. It wasn’t actually raining but there was a general mistiness across there giving rise to some rather fuzzy views of the fells to the west of us. 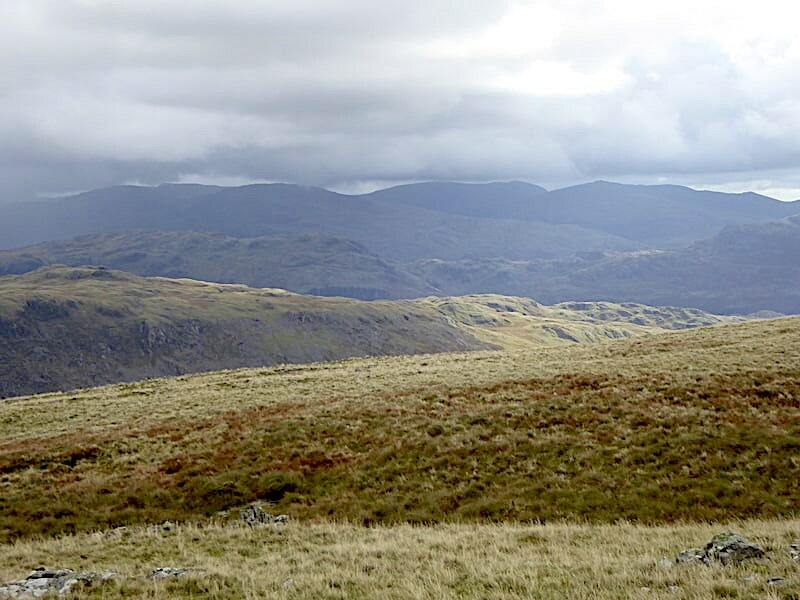 Here a patch of feeble sunlight manages to break through and give some definition to Middle Fell. 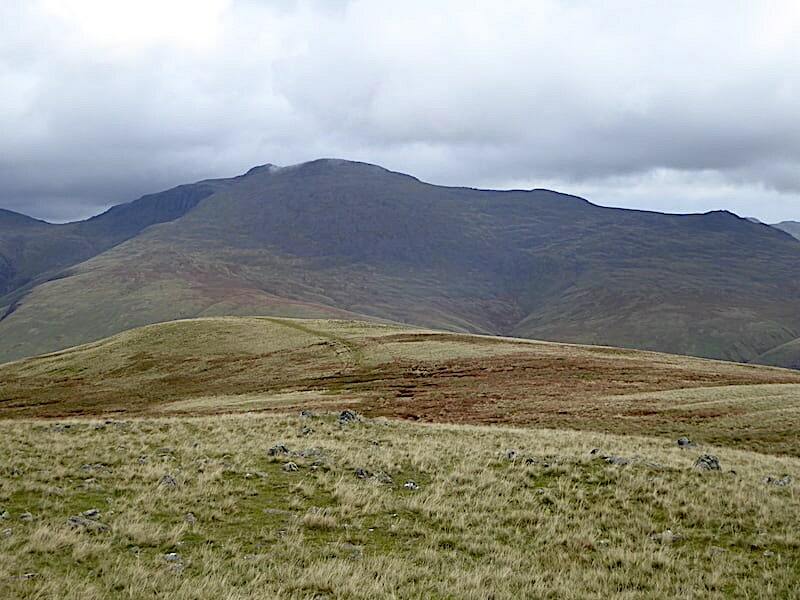 with the summit of Seatallan just behind it, but the cloud on the skyline keeps Haycock well hidden from view. 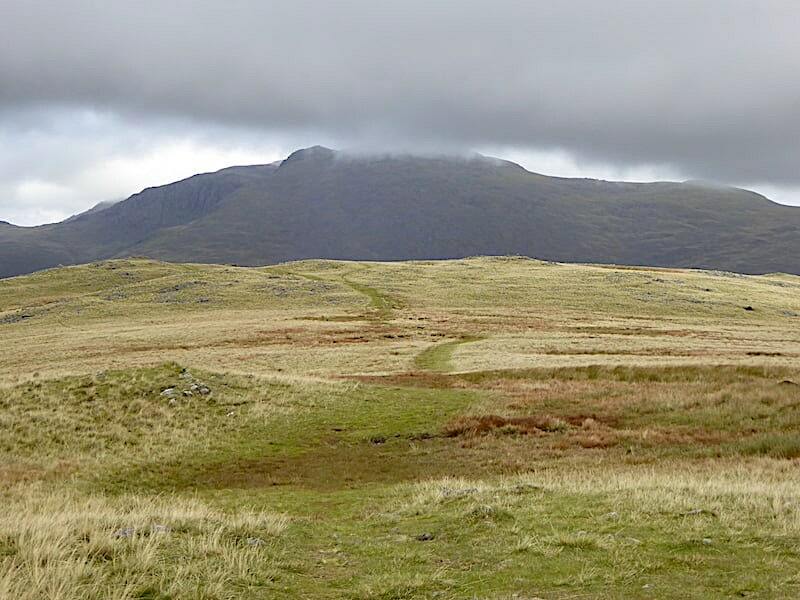 The view along Over Beck, between Red Pike and Yewbarrow, isn’t much better either with Pillar, on the centre skyline, reduced to a dismal grey lump thanks to the preponderance of heavy, and ominous looking, dark cloud. Occasional spits and spots of rain keep hitting our faces, will it develop into anything more sustained we wondered. 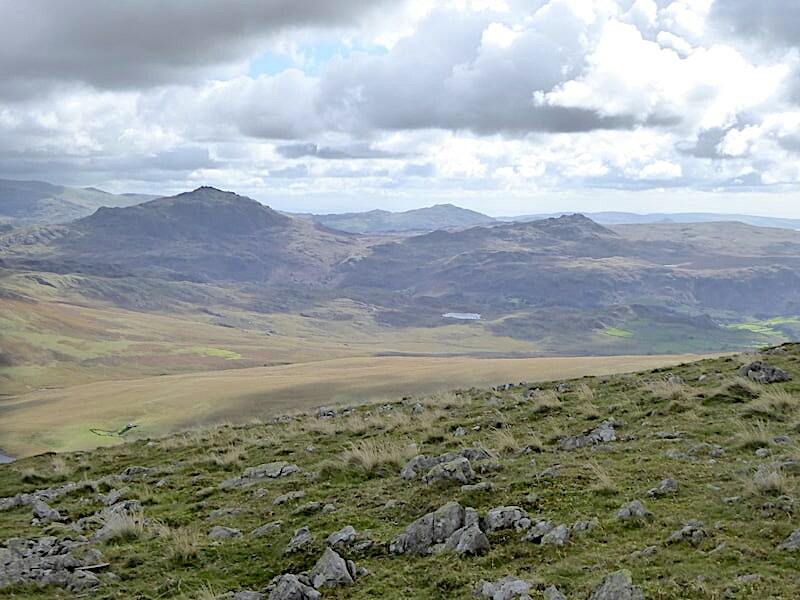 A spell of sunshine would be more than welcome right now as I take a look over to the east at Harter Fell and Green Crag framing the Coniston fells. My jumper just isn’t up to the job now so my lightweight windproof goes on, after a bit of a tussle with it in the wind, together with my gloves. I guess the view gives you some idea of the coldness up here at this point. Not a hint of sun anywhere to be seen. 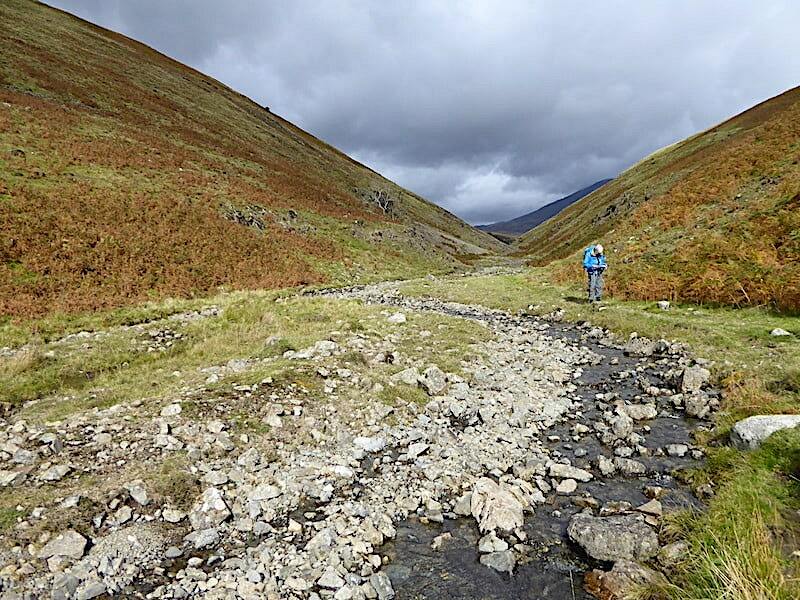 J continues to tough it out with just a jumper though as he walks across to take in the view …..
….. down Greathall Gill. He’s not a fan of gully peering but, as it lacks, at this point anyway, any hint of being precipitous this is perfectly acceptable. 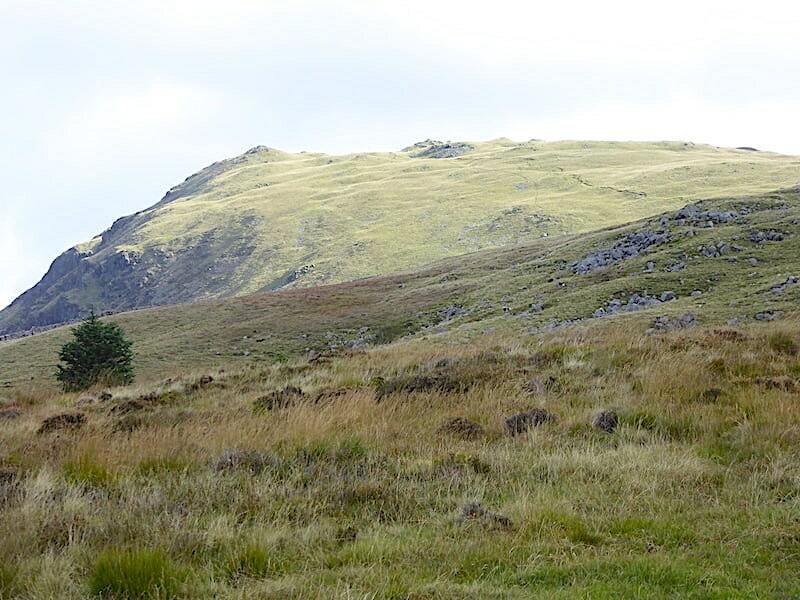 We leave Irton Fell and Greathall Gill behind and begin the ascent of Whin Rigg. A steady climb on a well trodden path with no obstacles or difficulties. 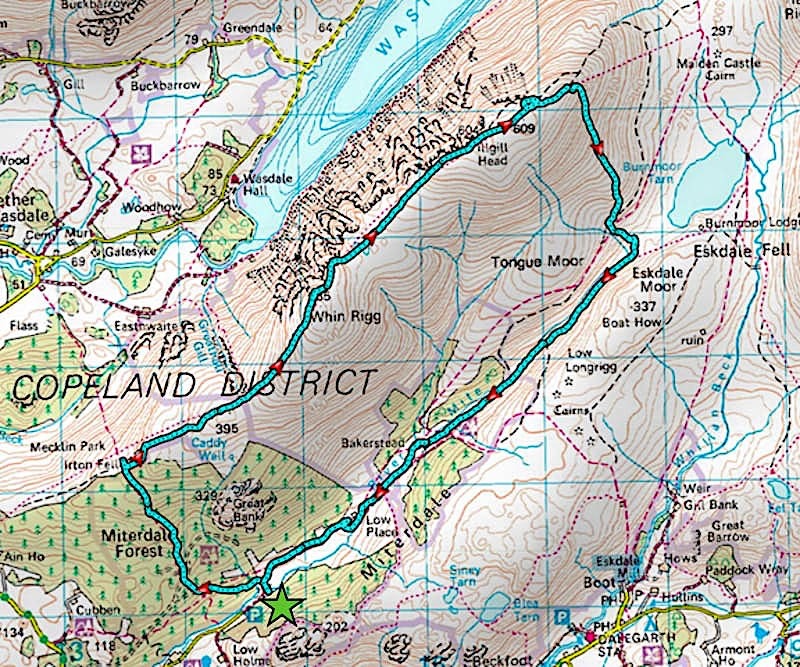 We’ve just seen our first walker of the day, a solo chap using a path some distance below us so he’d probably walked up from Nether Wasdale via Greathall Gill. 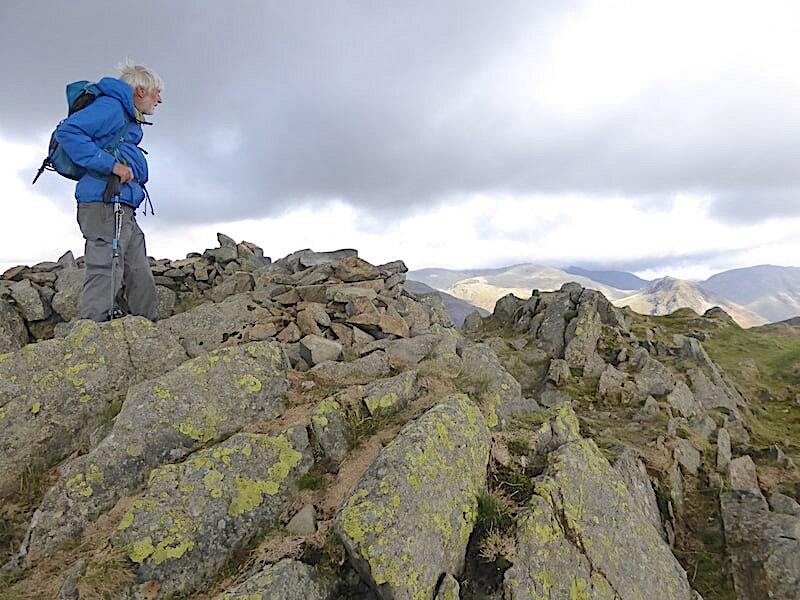 J finally yields to the inevitable and his jacket goes back on at the shelter on the top of Whin Rigg. Just in time too as a short sharp shower passes over us, raindrops as big as marbles splatter our jackets and leave large damp blobs all over them. It wasn’t worth donning waterproofs as the shower moved on after a minute or so. J examines the likelihood of using the shelter for a Mars Bar stop eventually deciding against since its not deemed high enough to give much protection from the wind. The solo walker I mentioned previously arrived shortly after I took this shot, jacket hood pulled up tight and similarly rain spattered. He was a young lad with whom we exchanged a quick hello before we moved off. 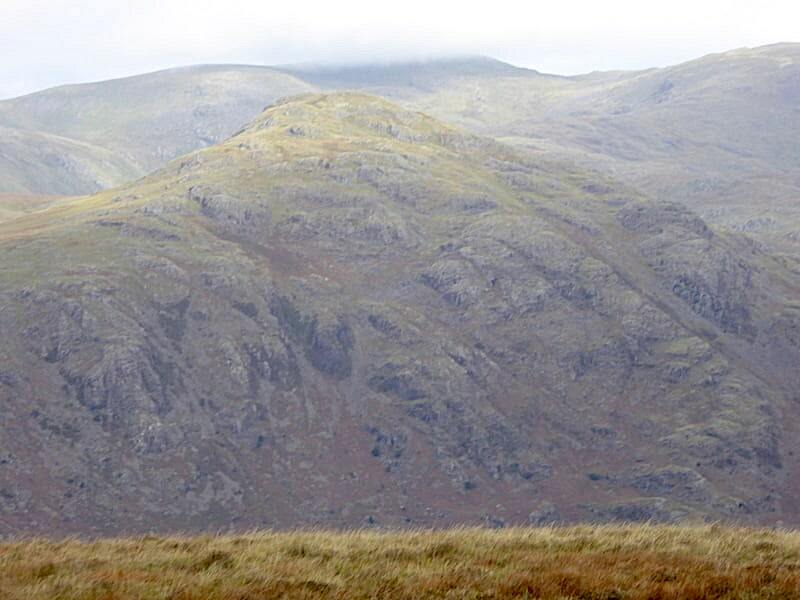 He didn’t follow us across to Illgill Head so maybe Whin Rigg was his only objective today. 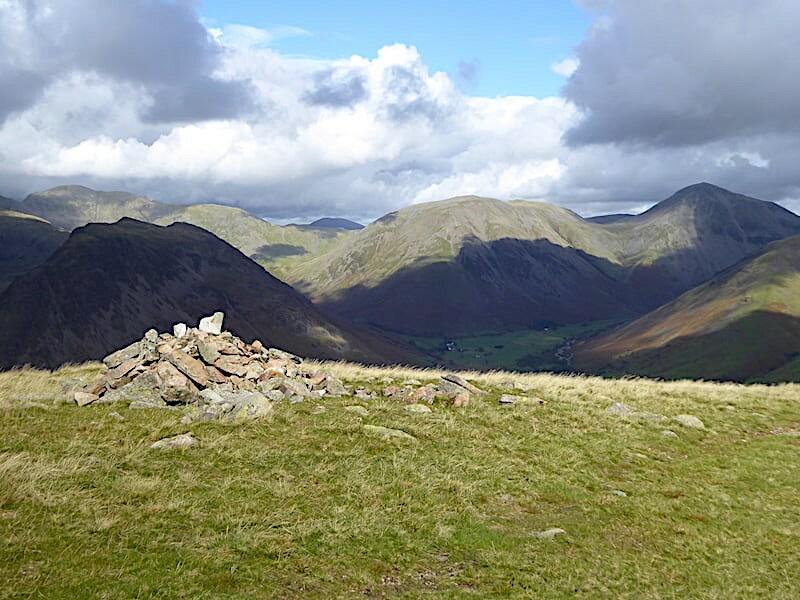 Still under the heavy cloud but at least the general mistiness around Wasdale looks to have vanished and a couple of breaks in the cloud allow enough sunlight to light up Red Pike and Yewbarrow. Two months ago we were sweating our way up the pair of them in shorts and t-shirts, we’d probably be hypothermic by now if we’d tried that today. 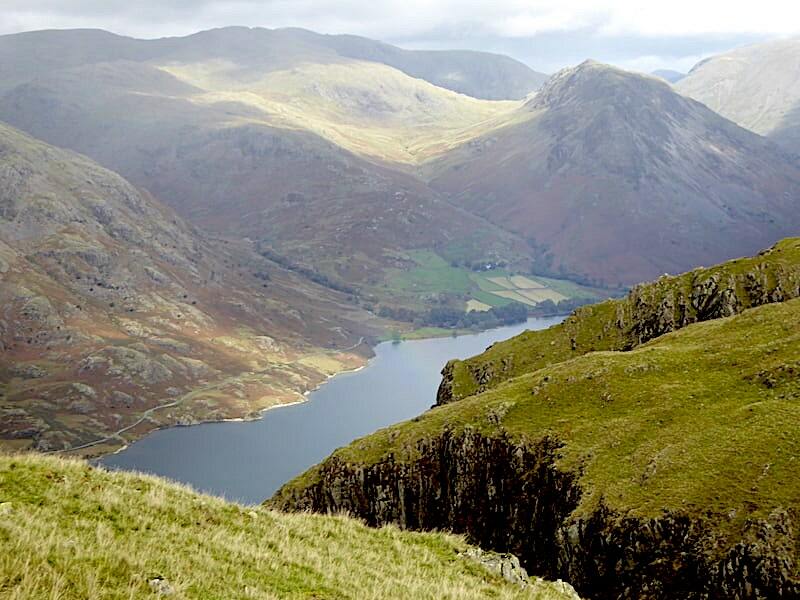 ….. from where we can look down and view almost the full length of Wast Water. Moving the camera a little to my right for this view of the unnamed tarns in the depression of the ridge and Illgill Head rising beyond them. 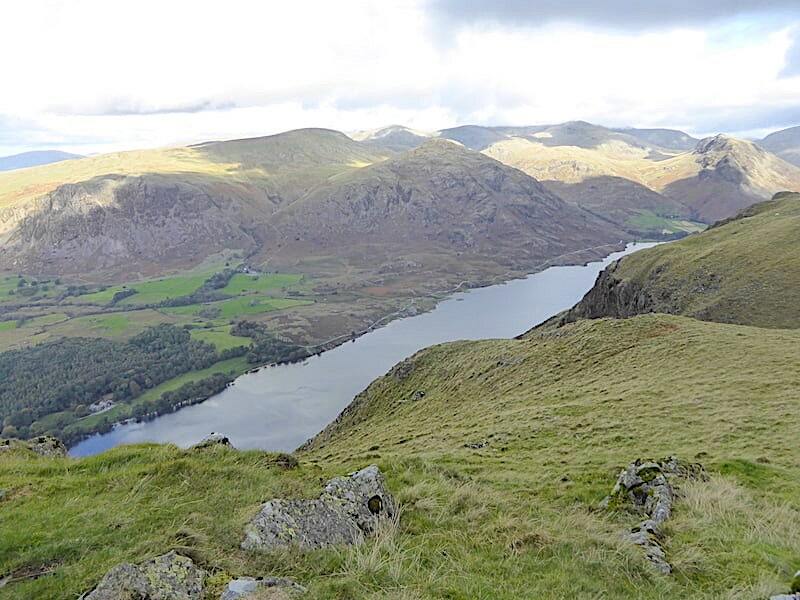 A little further along and Buckbarrow and Middle Fell get a few seconds worth of sunlight. We thought we might even get more than a few seconds as a good sized patch of blue sky appeared and at last some warmth landed on us. Nearby was a cluster of sheltered outcrops so off we went to sit in the sun and out of the wind to take the postponed Mars Bar break. 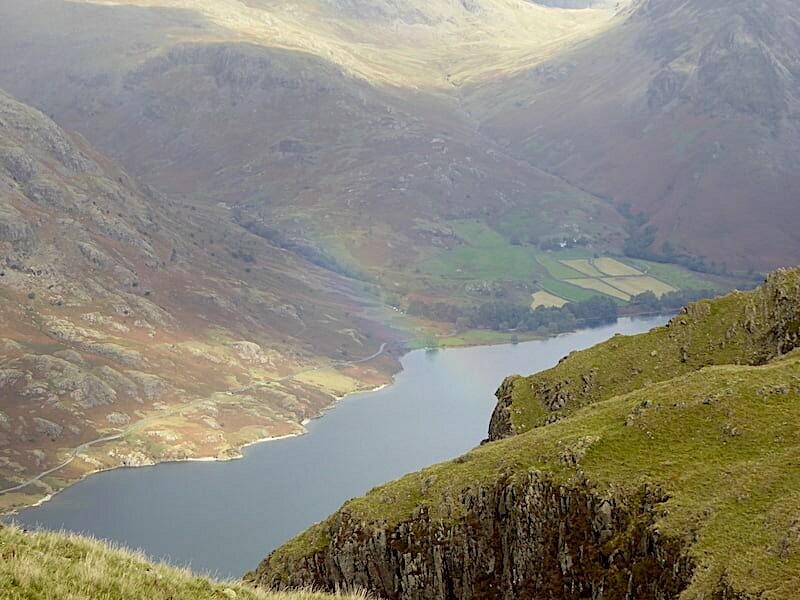 We carried on along the rim for a while, gazing down at the changing views of Wast Water every now and then as we walked across. A hint of a rainbow suddenly appeared, that’s it in the shot, the rest of it was nowhere to be seen. 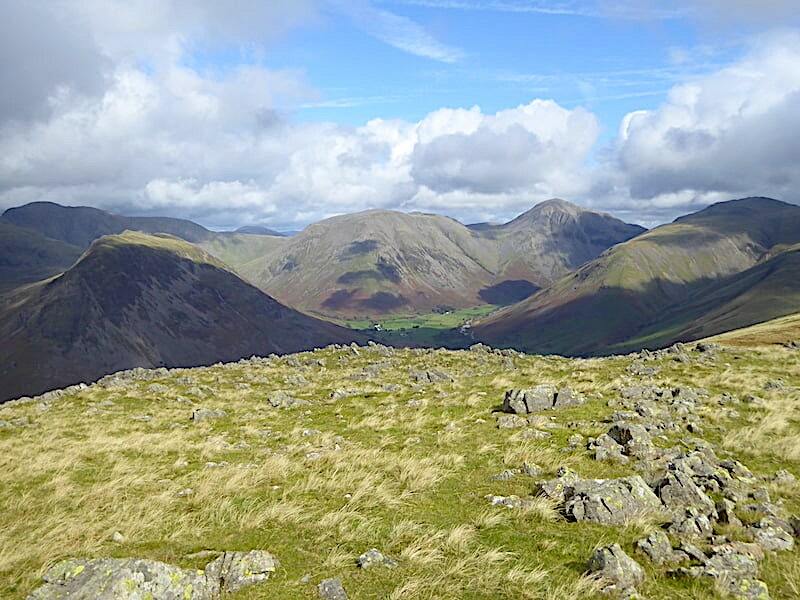 Zooming out for a longer view of Wasdale Head and some of its surrounding fells. More heavy cloud came over so the views were back to indistinct once more. 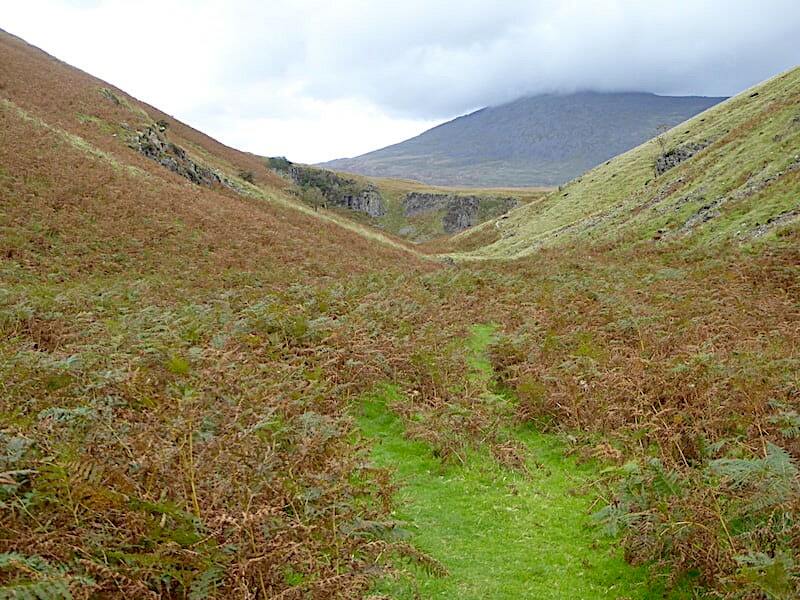 We left the rim and took to the central path across the ridge to gain some respite from the incessant wind. It wasn’t of the knock you to the ground strength but enough to have us pulling hoods up tight to keep the chill off the left hand side of our faces. 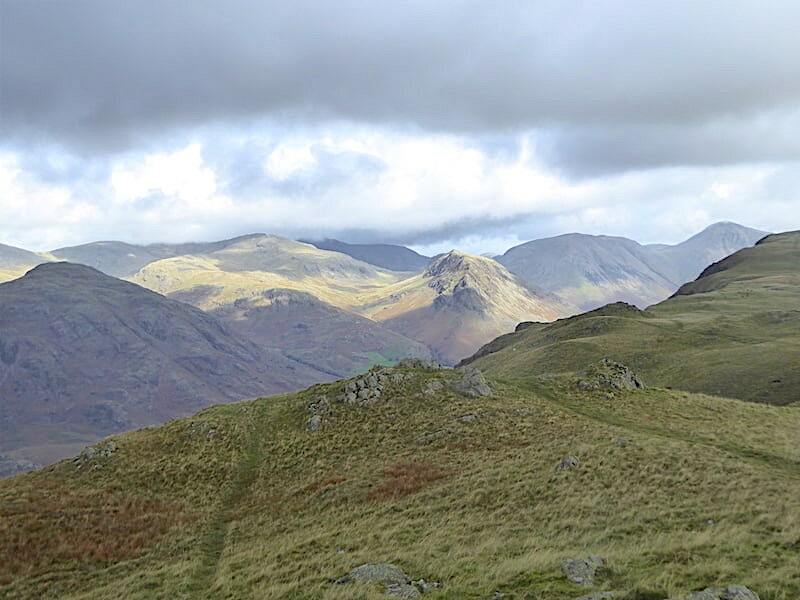 Great How in the middle distance with Crinkle Crags on the skyline. 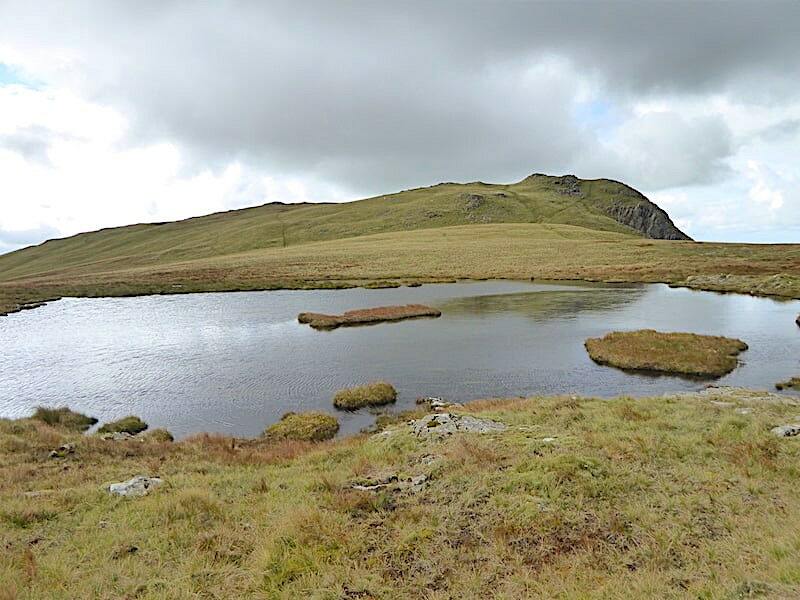 A look back at Whin Rigg from one of the unnamed tarns in the depression, even with the shelter of the slightly higher ground on the left of the shot the surface of the water is being ruffled. My windproof isn’t counteracting the chill so on goes my insulated jacket and up goes the hood. 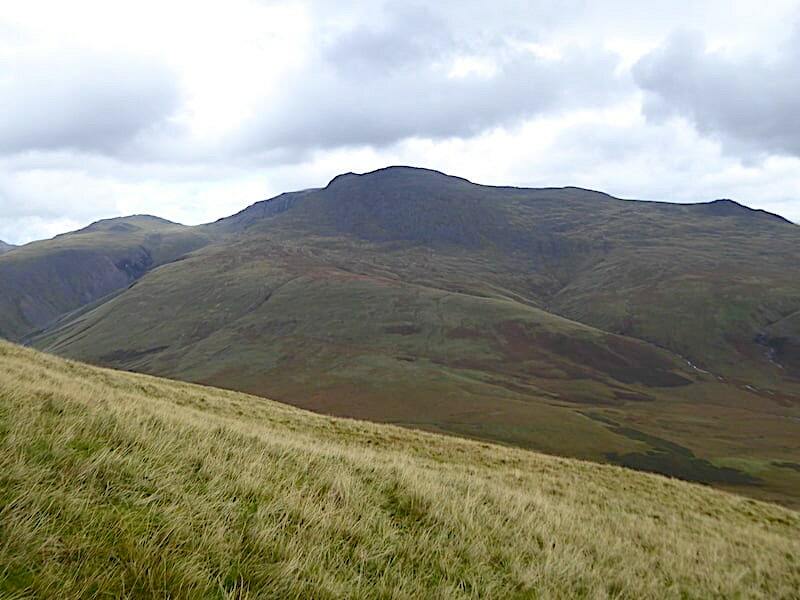 A look back along the ridge to Whin Rigg summit as the ground begins to rise up to Illgill Head. A small herd of Galloways were roaming freely up here but took absolutely no interest in us, other than a couple of very forlorn stares, and posed no problems. 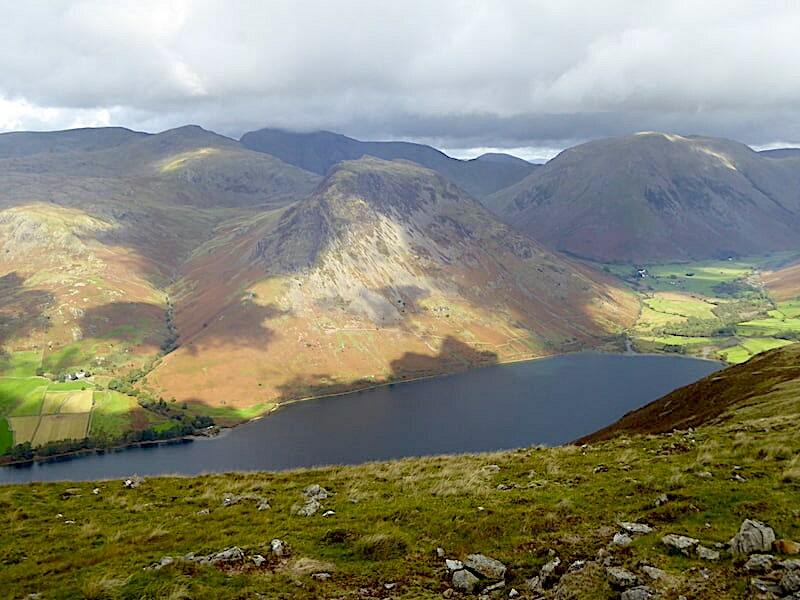 The views get better and better as we walk along, especially when the sun managed to break through and highlight one or two at a time, here we have Kirk Fell and Great Gable showing off in the dappled light. 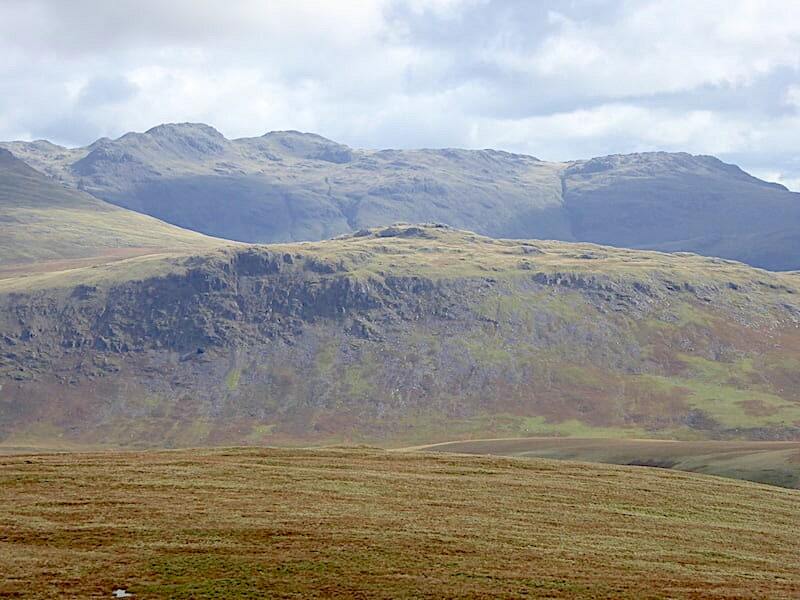 The heavy dark cloud at the top of the shot has been with us for some time now and …..
….. extended the full length and width of the ridge and beyond, where its base is just clipping the summit areas of Scafell and Slight Side. 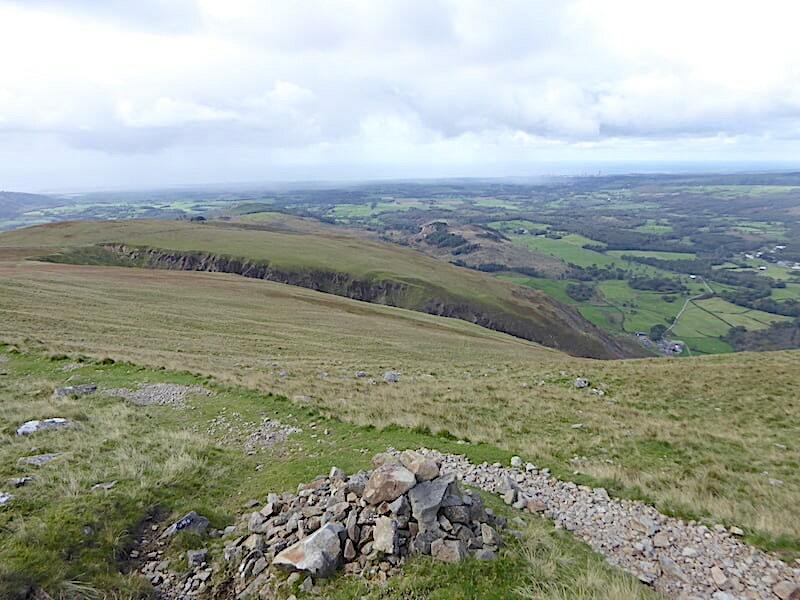 We aren’t too far away from Illgill Head’s summit shelter at this point, and the two walkers who have recently vacated it are now behind us and heading for Whin Rigg. J decamps to the shelter while I take a few summit shots. 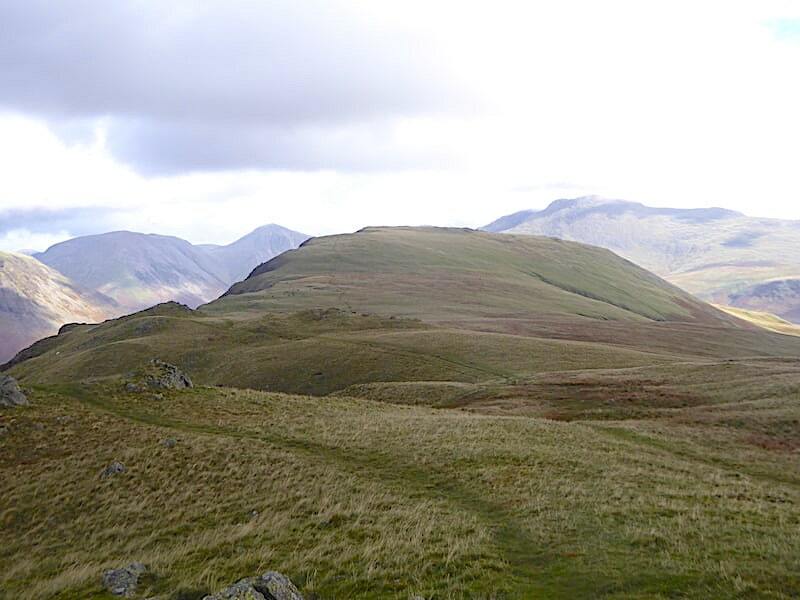 Red Pike is prominent in the sunlight with Scoat Fell and Pillar on the skyline behind it, and the heathery scree slopes of Yewbarrow to its right. Now that’s more like it, endless and fascinating drama over Wasdale as the clouds and sun cast constantly changing shadows across the fells. This type of cloud provides endless permutations of effect and almost as soon as one aspect appeared it was quickly succeeded by another quite different one. 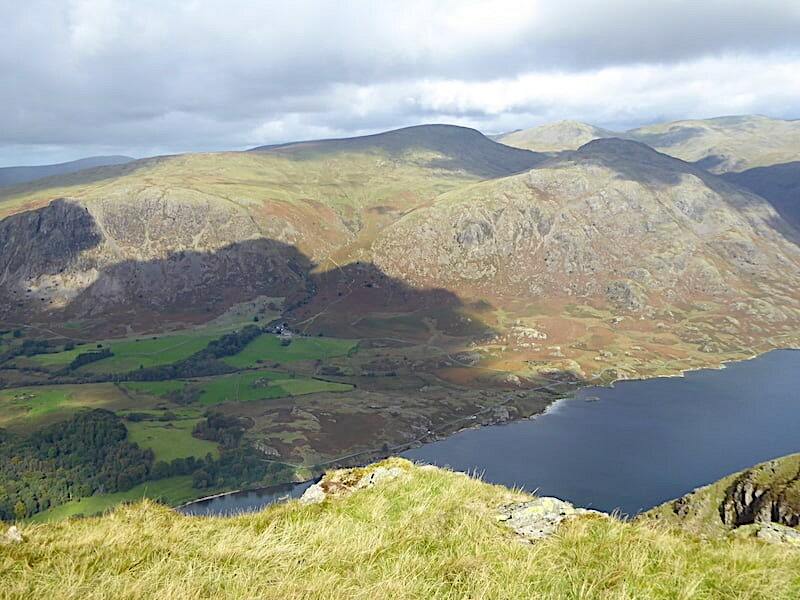 The light bounces around, the sky seems bluer, the clouds whiter, rocks and streams glint and sparkle as the light hits them, and the fells are brightly lit or plunged into deep shadow. This kind of cloudscape works some magic, unlike the endless mass of dull grey cotton wool stuff which often blankets us for days on end, blots out every bit of light and leaves the landscape looking as dull as ditchwater. 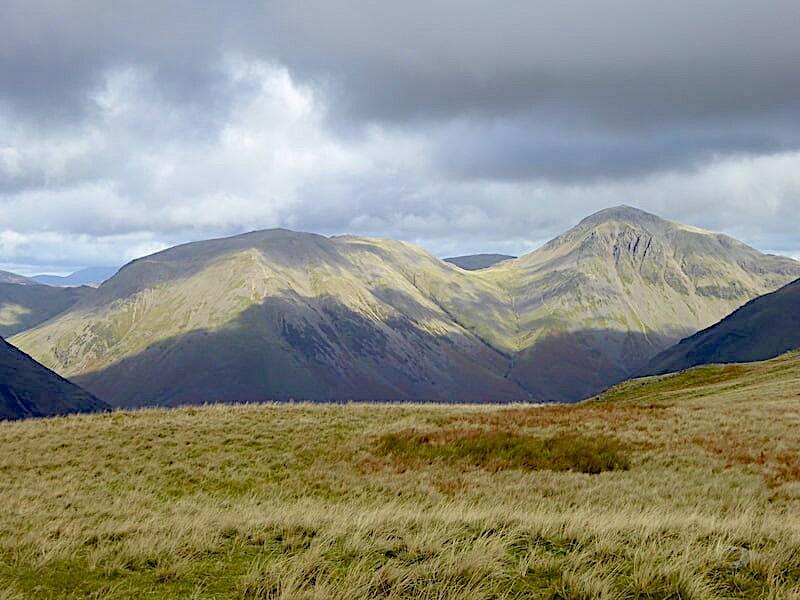 More drama over the Scafells, on the right, as the cloud base clips their tops while Great Gable and Lingmell to their left remain clear. 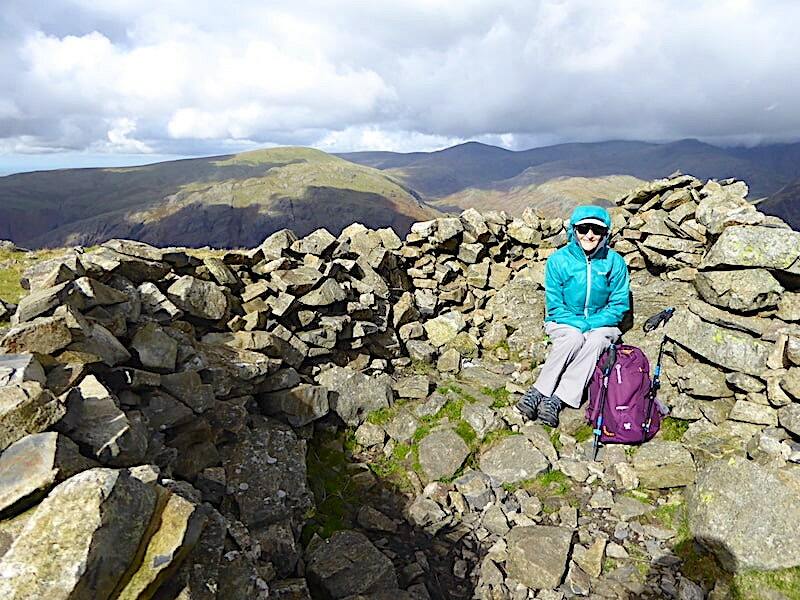 Its just under three weeks since we were over on Lingmell and Scafell Pike, then it was still summer and we were still down at t-shirt level, now its autumn and we’re both wearing every bit of clothing we have with us. A post lunch shot at the Illgill Head shelter. The sun might be shining but I’m wearing four layers of clothing on my upper half and wishing that my winter weight trousers were covering the lower half instead of languishing in a drawer at home. Both jacket hoods are pulled on over my cap and hands are tucked into my sleeves as I haven’t put my gloves back on yet after stowing my lunch box into my pack. The flask of coffee was more than welcome but I’m still not that warm so its time to get moving again. Before leaving we had a little wander around the summit area for a few more shots. Yewbarrow is beautifully lit and standing out very clearly whilst all around the cloud is extending, lowering, thickening and beginning to look very ominous. 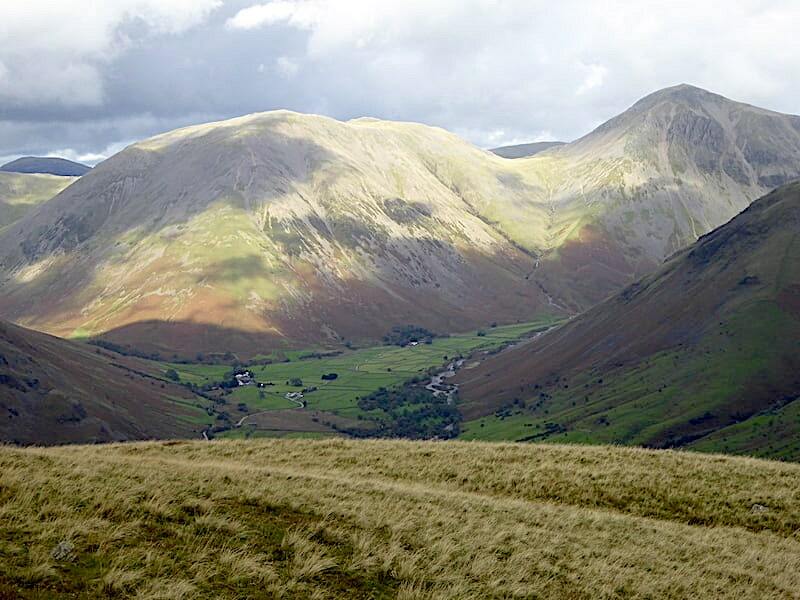 Yewbarrow again with Kirk Fell at the head of the sunlit fields of Wasdale Head. 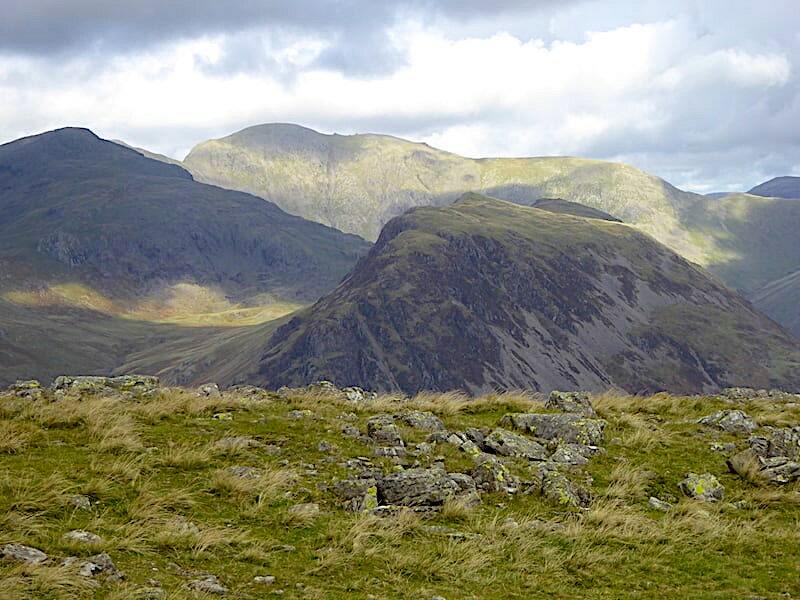 Another look towards Lingmell and the Scafells as we work our way around the area just below the summit. 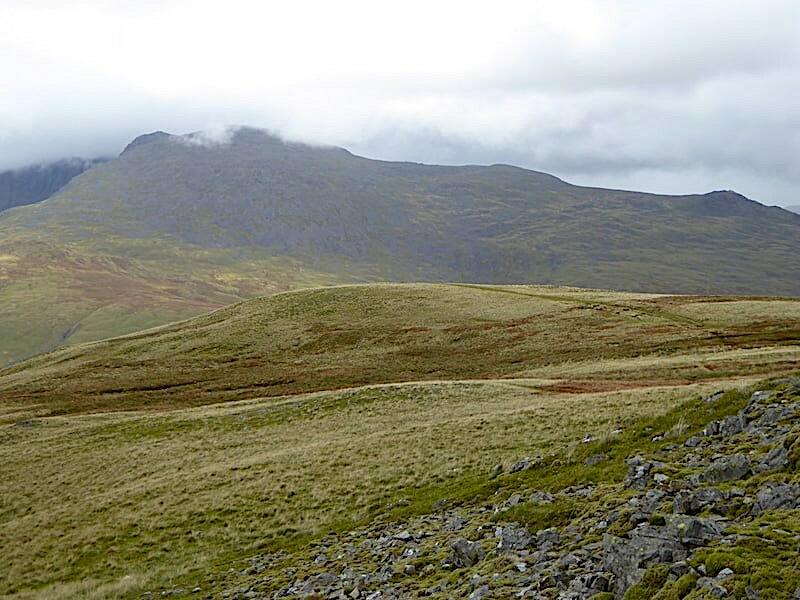 Beyond the descent path are Scafell and Slight Side. 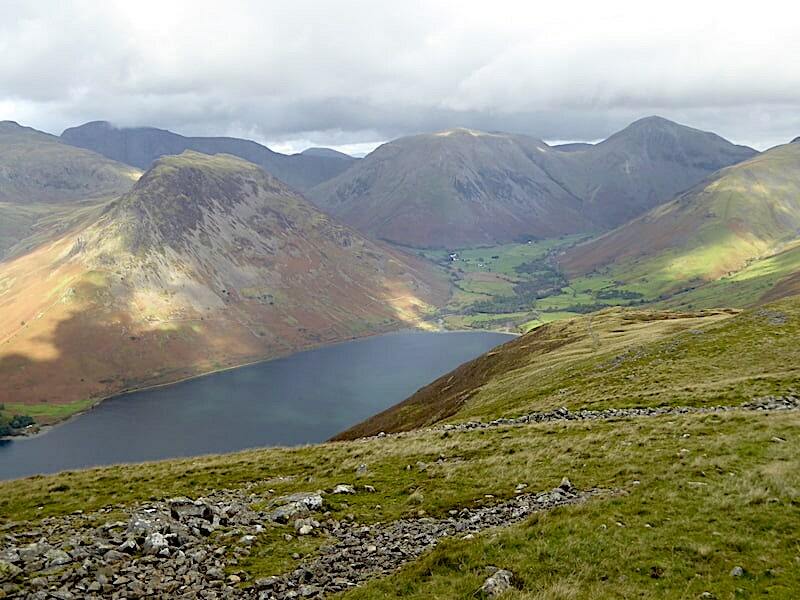 Wasdale Head nestling below Yewbarrow and Kirk Fell. 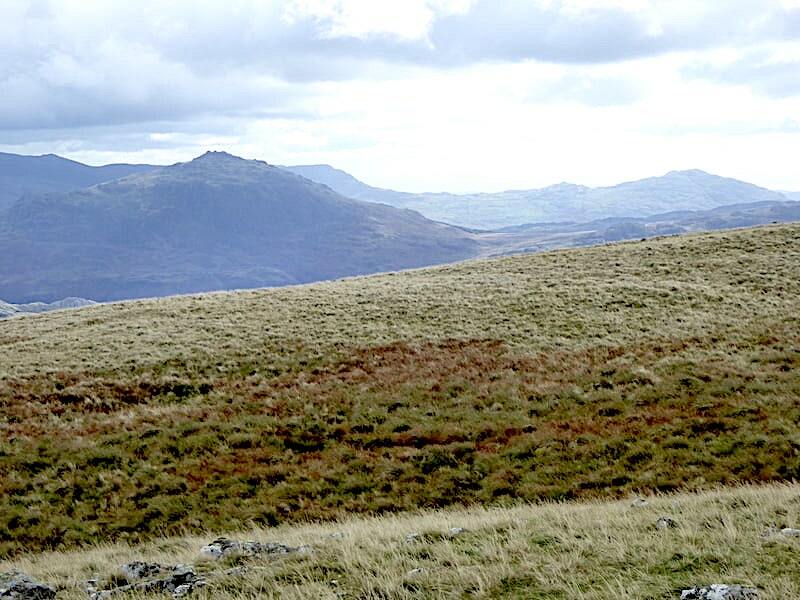 To the east is Harter Fell, on the left, and Caw over on the far right. 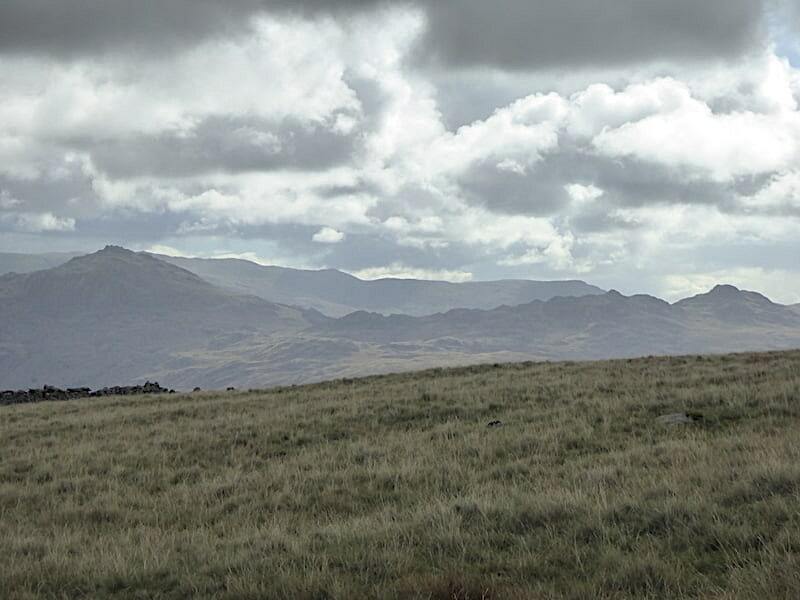 Cloud lowering and thickening over the Coniston fells. 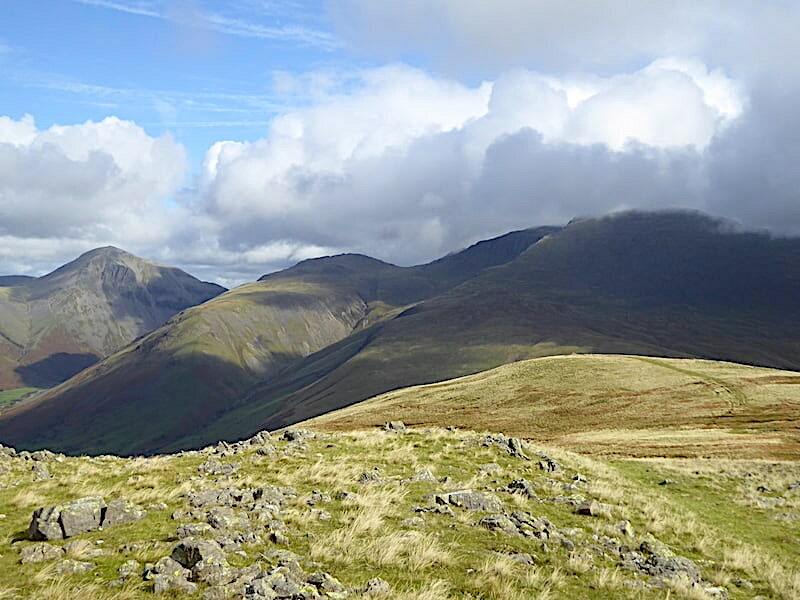 Scafell Pike, Scafell and Slight Side from just below the summit of Illgill Head. Finally I get a shot of Pillar with some sunlight on it. Shortly after I took this another short sharp shower came over, this one dumped pin head sized hailstones on us for a minute or so before blowing over. 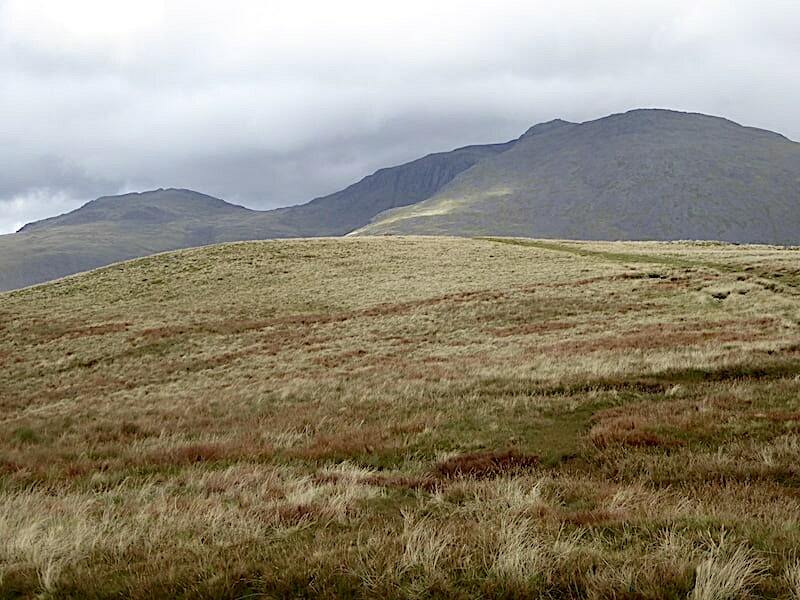 Lingmell and the Scafells again beyond the colourful grassland. 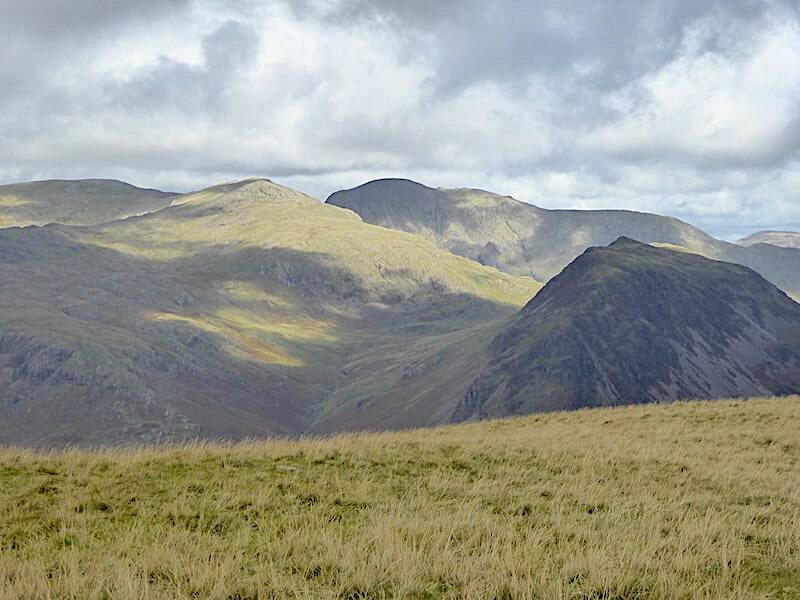 Yewbarrow, Pillar, Grasmoor and Kirk Fell as we continue our perambulation. 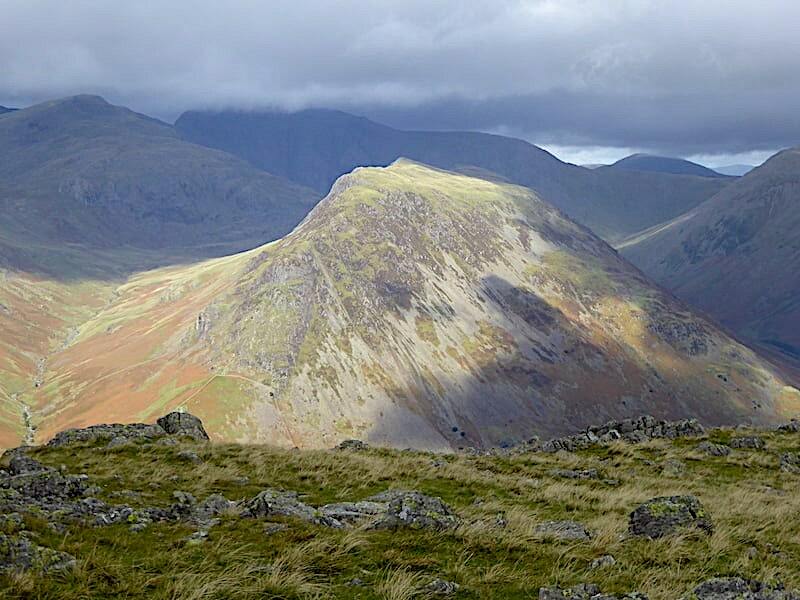 More drama and atmospherics above Wasdale Head from the viewpoint cairn. 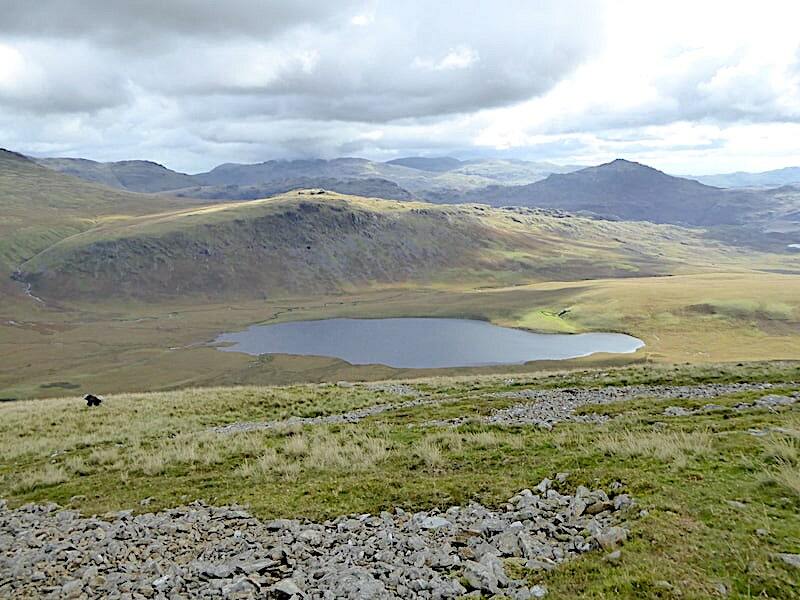 A slightly brighter view in the east with Harter Fell and Green Crag now framing Caw, and a view of Eel Tarn (I think) below all of them. 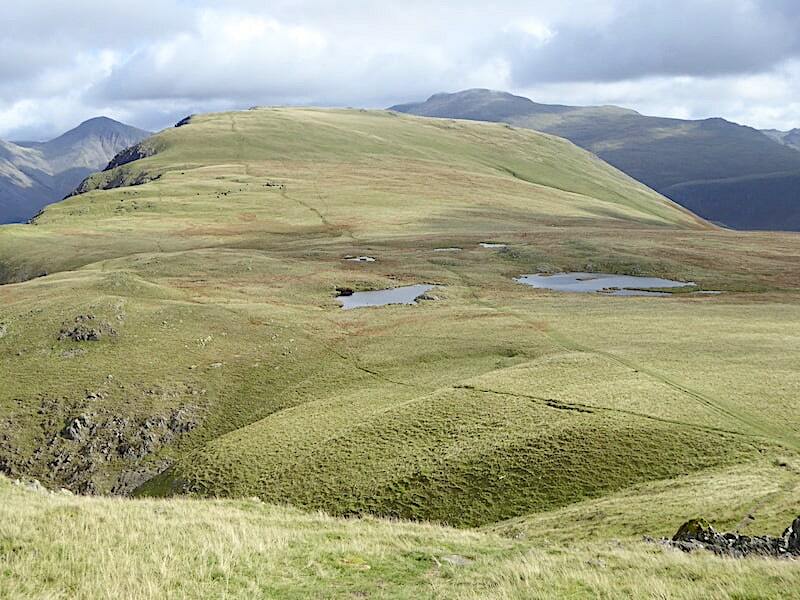 We descend Illgill Head off path with Burnmoor Tarn, guarded by Great How, below us …..
….. with a last look back at Wasdale Head and its patchwork of fields and walls, together with Kirk Fell and Great Gable. 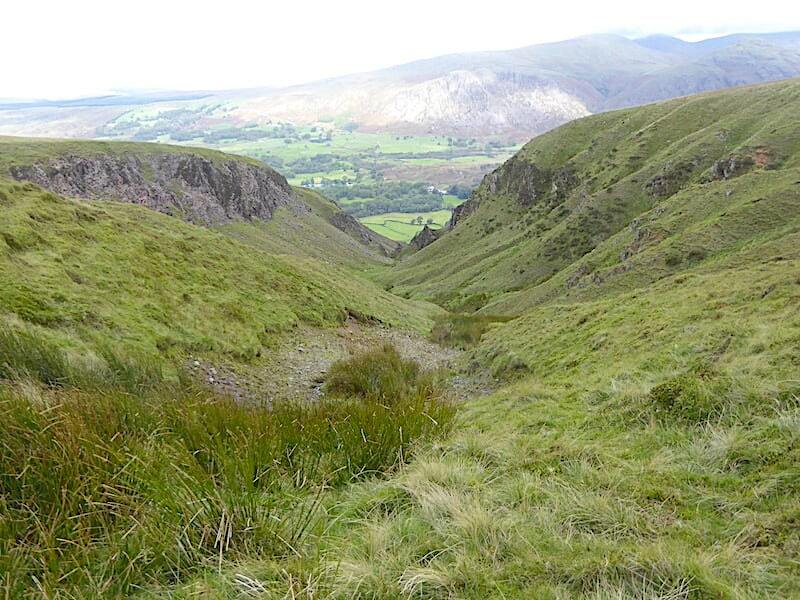 There are no difficulties descending Illgill Head off path, all is grass with just a few patches of stony ground here and there, all of which are easily avoided. 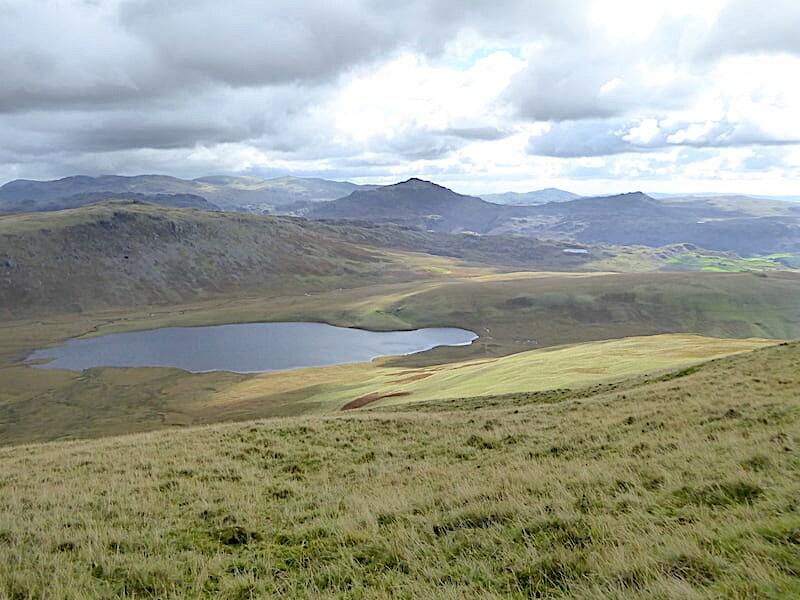 We’re heading down to Miterdale Head which is out of sight at the moment just below the sunny grassland to the right of the tarn. 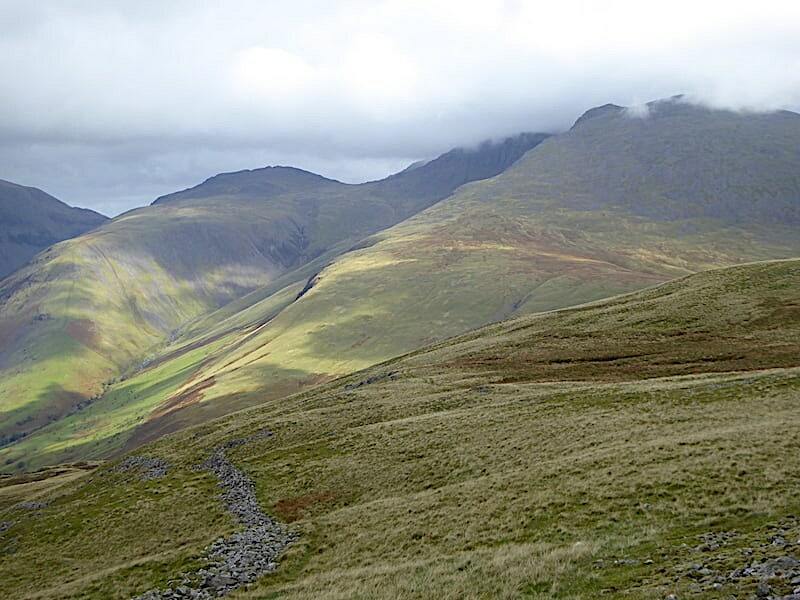 A final look back to Lingmell, Scafell Pike, Scafell and Slight Side before the view disappears. The cloud has lifted and broken so we begin to hope that we will at least enjoy a sunny afternoon walk down Miterdale. 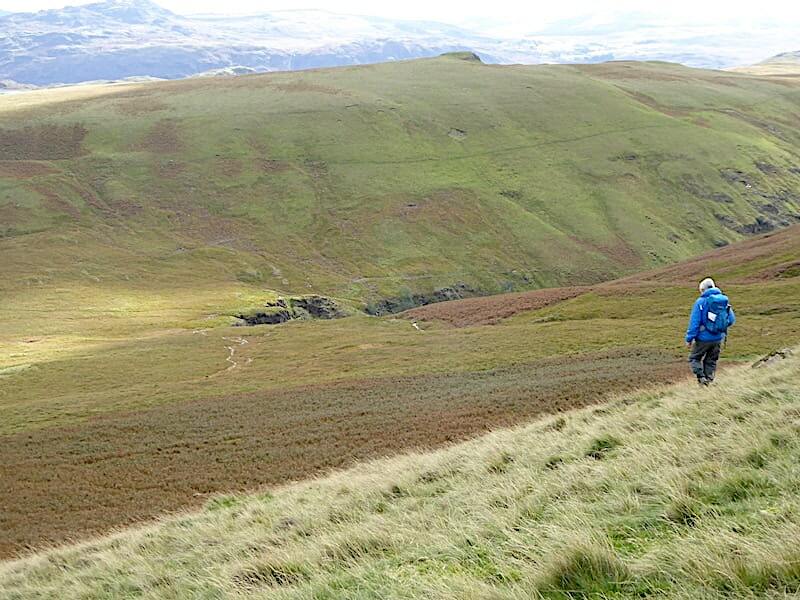 The rocky cluster below indicates the head of Miterdale and on the fell side behind two paths can be seen, our route back to the car will follow the lower path down through the bottom of Miterdale. 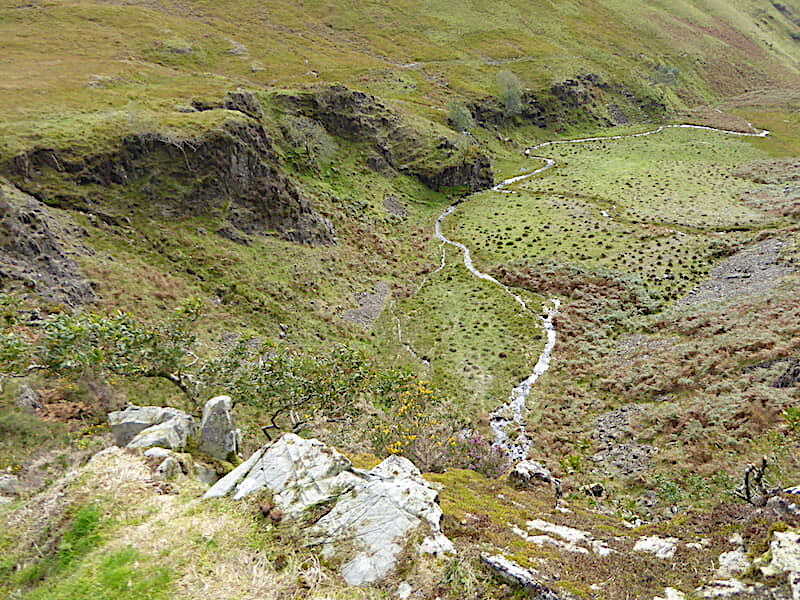 Looking down into the bowl of rocks at the head of Miterdale as we cross over to pick up the path down the valley. A longer view down the valley from the squelchy depression just above the cliffs. Lots of water was flowing down the fell sides and just running freely over the grass, but none of it was flowing over the cliffs, it was simply hanging about and creating a large soggy mass which there was no way of avoiding so it was a quick splosh through to the relative dryness of the opposite side. 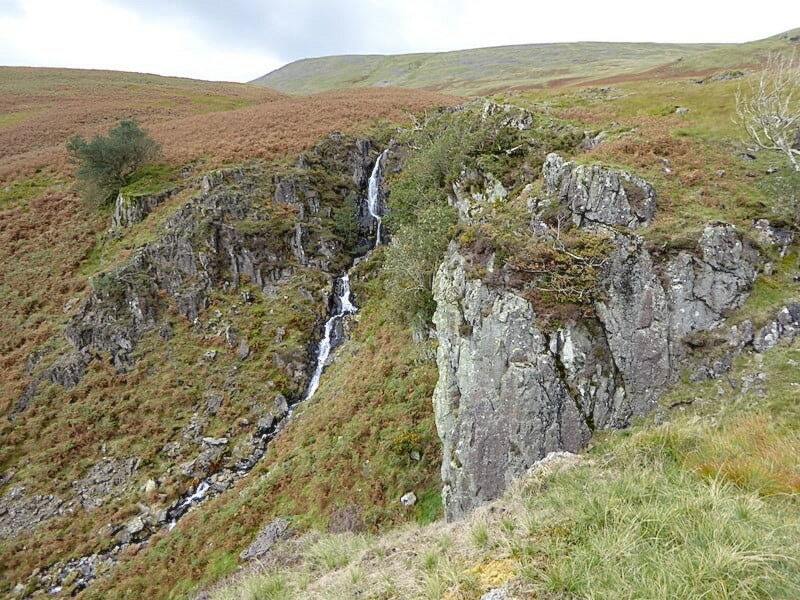 On dry ground again and a chance to look across at the waterfall dropping out of a beck which rises high up on Tongue Moor, just below the summit of Illgill Head, and which becomes the infant River Mite. 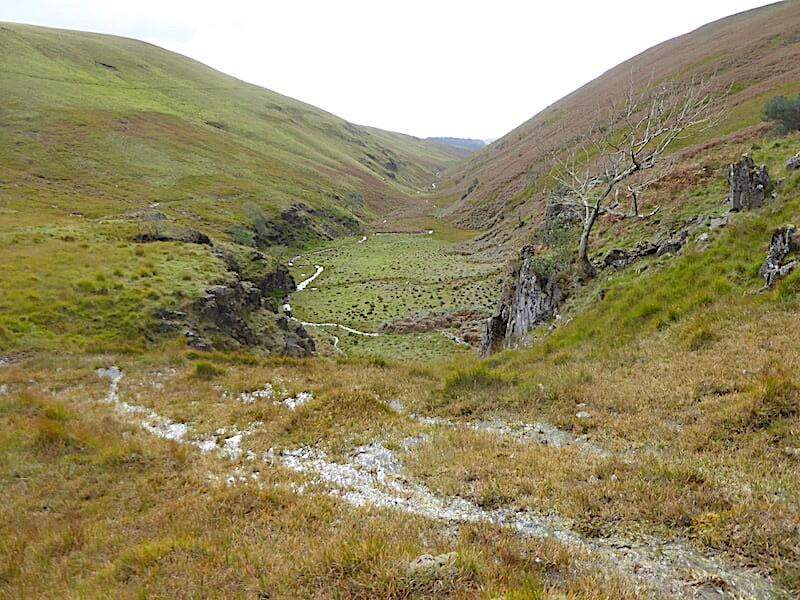 It would seem logical to expect Burnmoor Tarn’s outflow to make its way over here and disgorge itself over the valley head’s cliffs but it doesn’t. 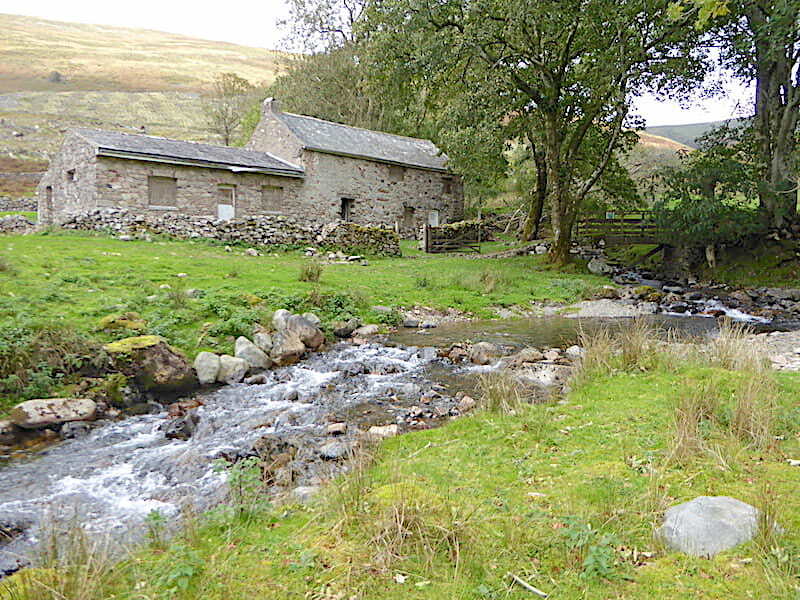 Some geological quirk or other has caused the waters of Burnmoor Tarn to flow out of its north east corner becoming Whillan Beck as it flows beneath Great How on its way to Boot, where it was once used to turn the water wheels at Eskdale Mill, before eventually joining the River Esk at Beckfoot. The clouds clipping the Scafells once again as I take a look back at the rim of cliffs at the head of Miterdale from the pleasant grassy path down the valley. It didn’t quite turn into the sunny afternoon we were hoping for but we did get a sunny spell now and again and although the sky looks threatening it didn’t drop any of its contents on us for the remainder of our walk. I’ve just asked J to have a look at the gps to see how far down the valley we are at this point, the reply being that there was still a fair distance to go. 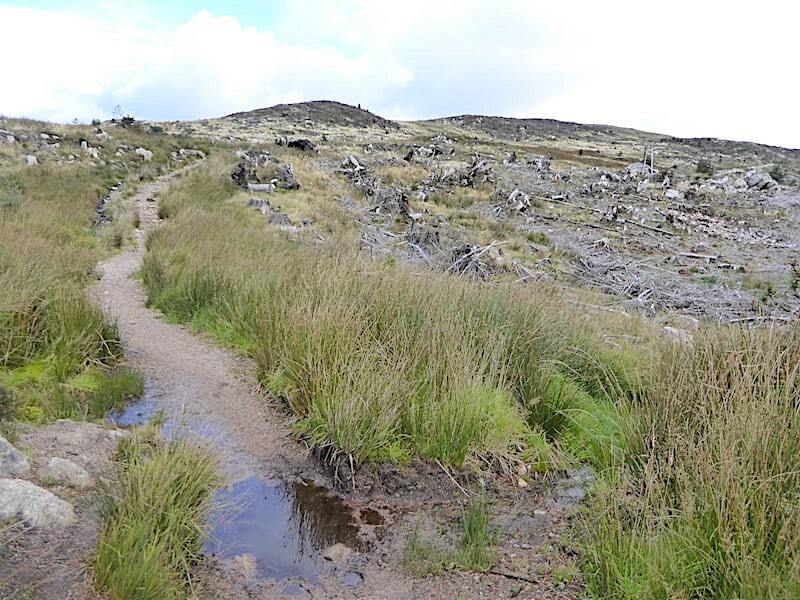 At times the path would come to an end on this side and we would have to cross over to the other one, but with a low level of water and an abundance of stones there was no difficulty in doing so. 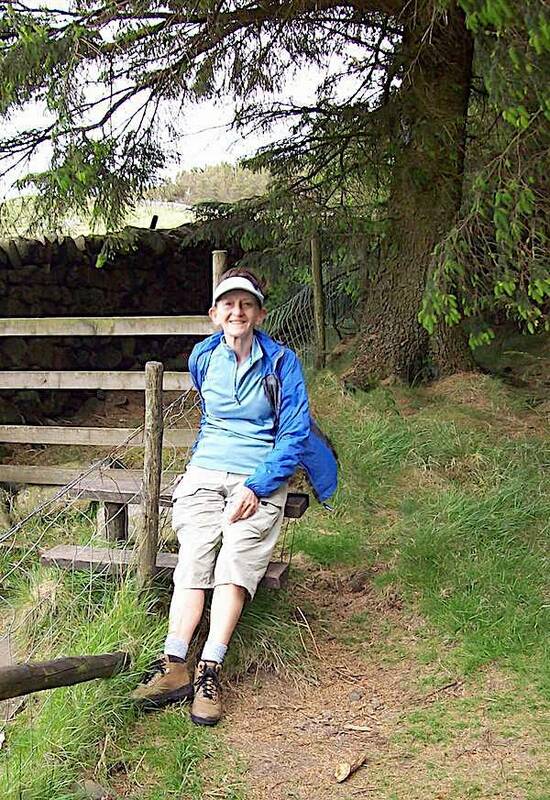 The gate in the wall signifies a swing away from the beck and the path continues over the slopes just above it. 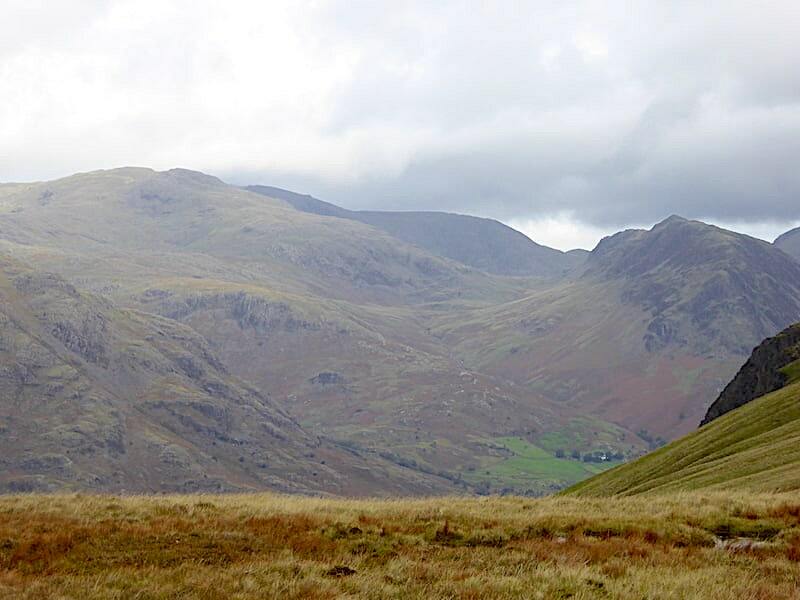 Scafell is still in sight as I take a look back. We eventually reach Bakerstead. Once the site of a working farm, first mentioned in a survey in the late 1500’s, but all that remains today is this building, now boarded up and neglected. 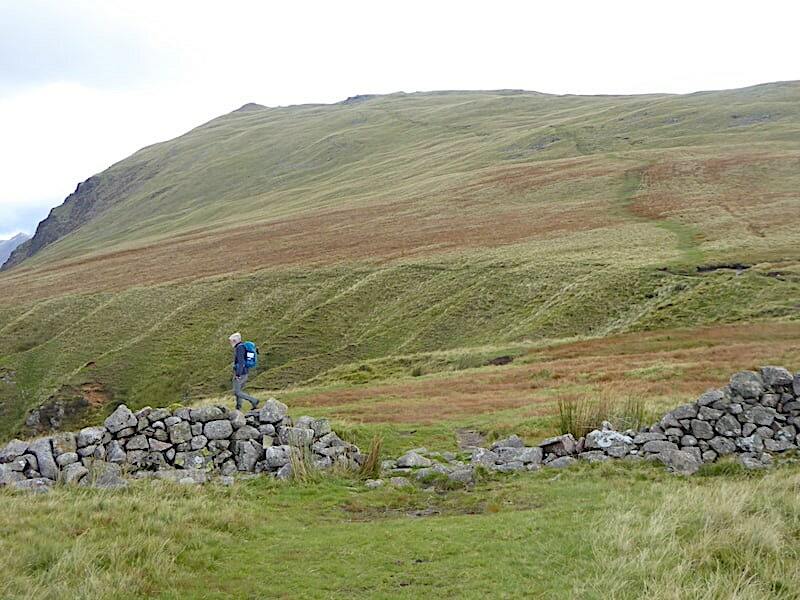 At one time it seems it was run as an outdoor pursuits centre by Wyndham School, Egremont. That school has since merged with another to form West Lakes Academy, Egremont so perhaps that marked the beginning of the centre’s decline. 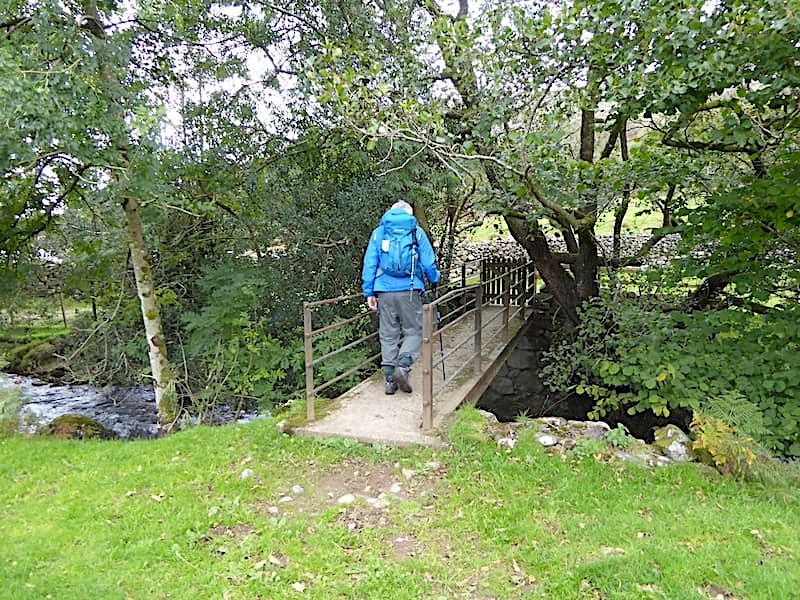 We would have gone across to take a closer look round and despite there being a bridge across to it we were unable to use it as the ford crossing was a foot deep under the water. 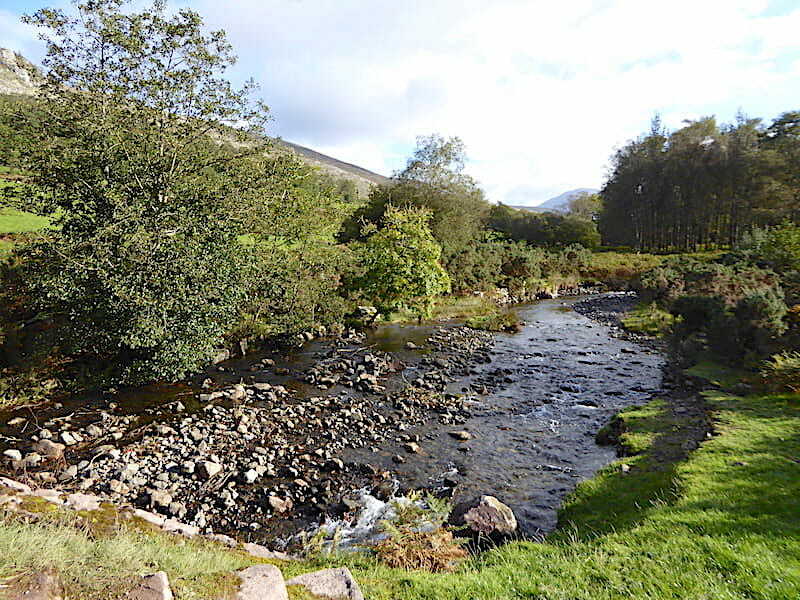 A crossing of sorts was available from this side which consisted of two tree trunks lashed together and slung across the beck. We weren’t desperate enough to view the old building to risk shuffling over two, who knows how old and in what condition, wet and slimy tree trunks loosely laid a good few feet above a substantial rocky pool so we remained on this side and continued with our walk. 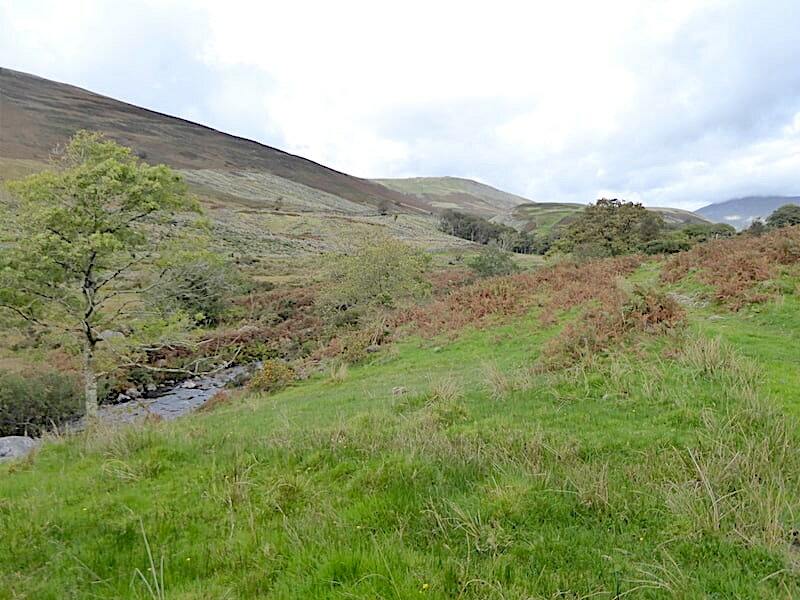 A last look up the valley, which by now had broadened out considerably and which in quite a few places was seriously wet, and then it was down to …..
….. a more amenable river crossing close to Low Place Farm. 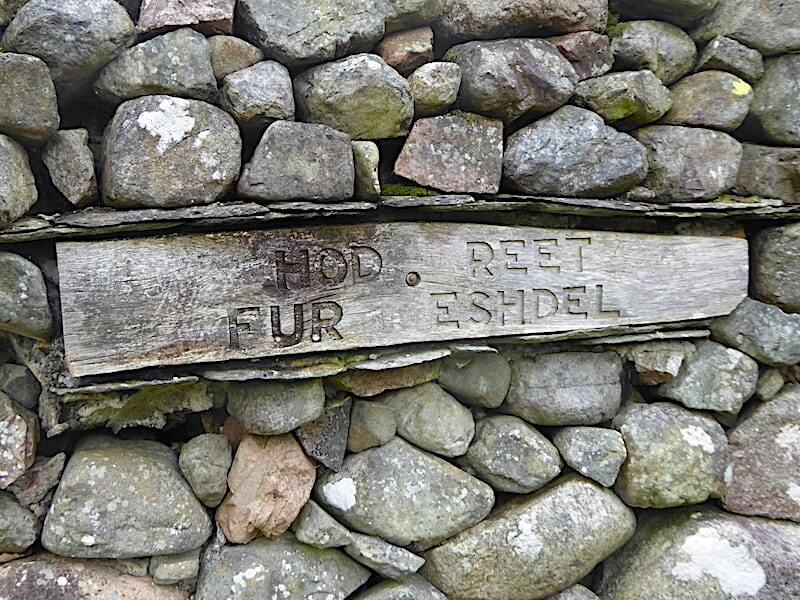 Direction sign in Cumbrian dialect embedded in one of the farm walls – ‘HOD REET FUR ESHDEL’ or in standard English ‘HEAD (or HOLD) RIGHT FOR ESKDALE’. 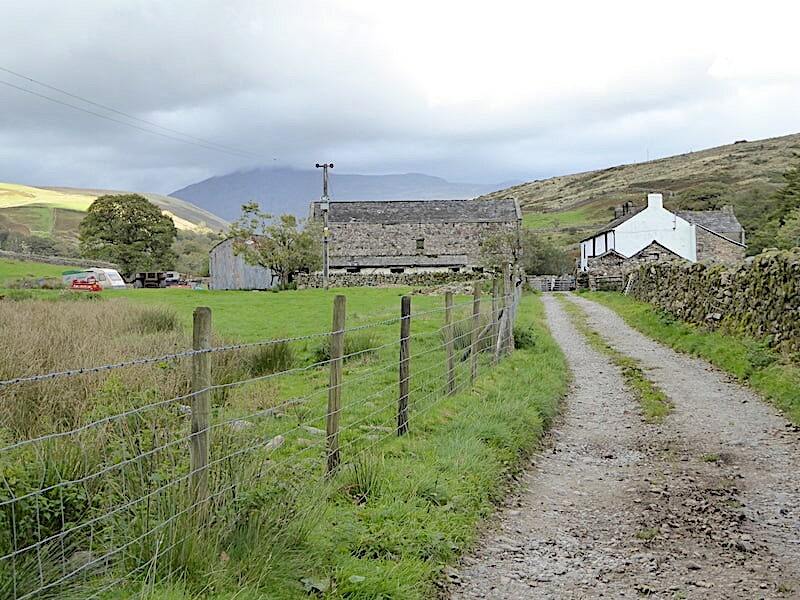 Excited and incessant barking from the farm’s hounds accompanied us as we approached and departed from Low Place Farm. I took a look back at the farm when we were safely out of their sight. From the farm there is just a short walk back to …..
….. the parking area just beyond the bridge. Three more cars have arrived since we parked here this morning but there was no sign of their occupants. We stroll down the farm track back to the car where we dump the packs and change footwear. Just before he switched off the gps J informed me that we had walked fifteen and a half miles, give or take decimal place or two. I was quite surprised by that since it really didn’t feel as though we’ve walked that far, and particularly as we’d only been walking for just a few minutes over five hours. I gave it no further thought on the drive home and later that evening J plugged the gps into his laptop only to realise that the reading he gave me had been in kilometres and not miles. You just can’t get the staff these days.